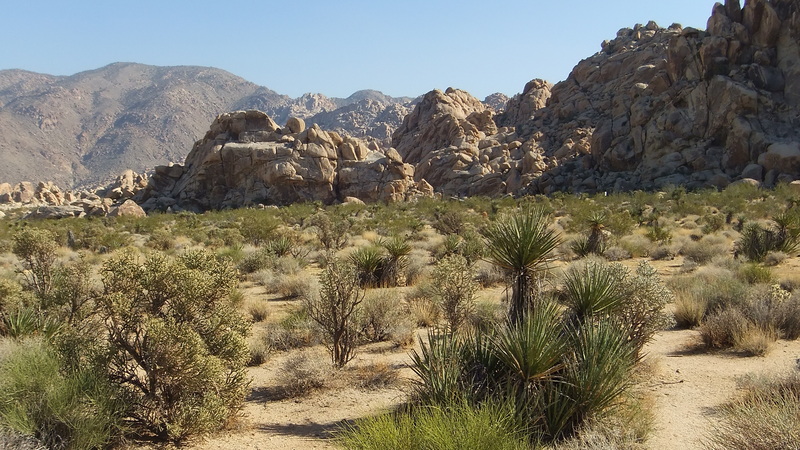 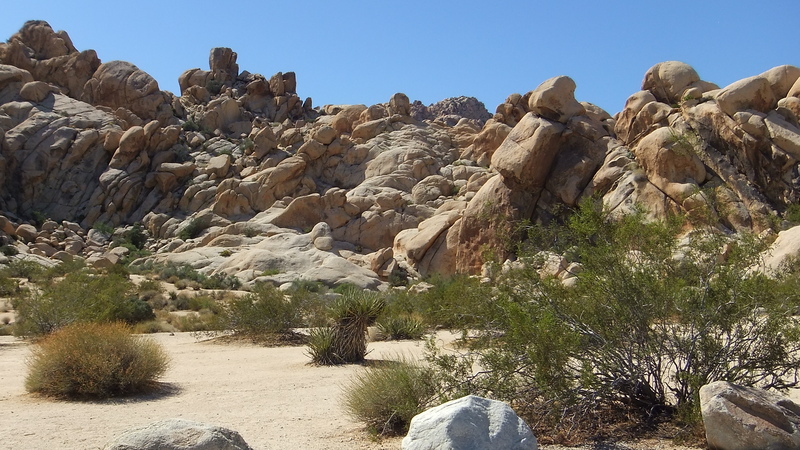 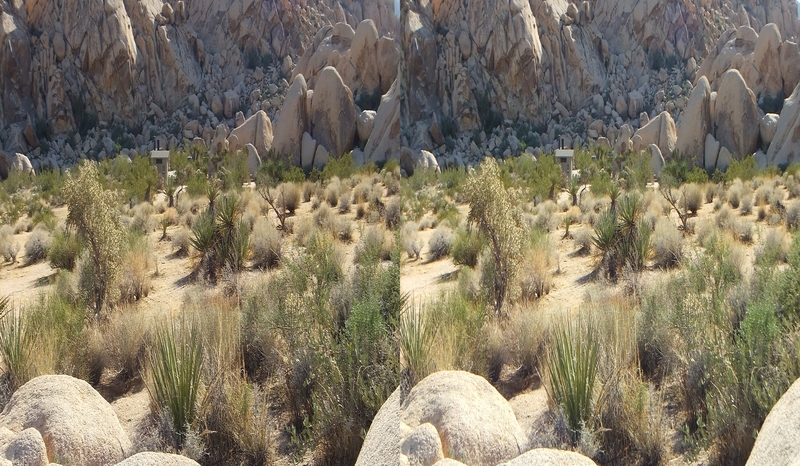 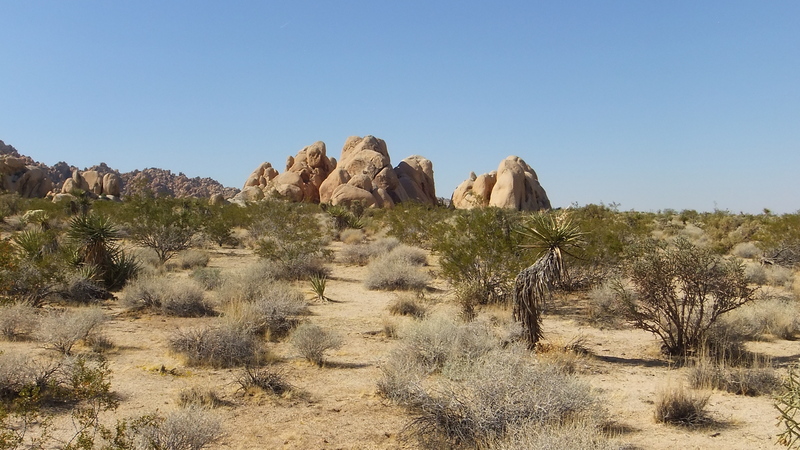 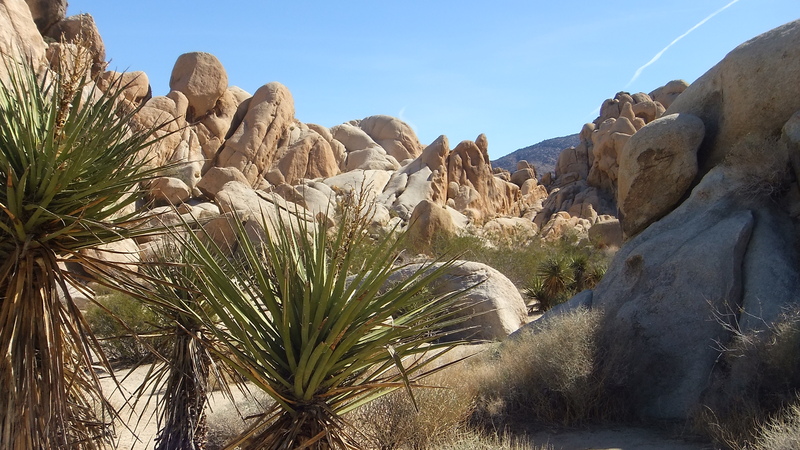 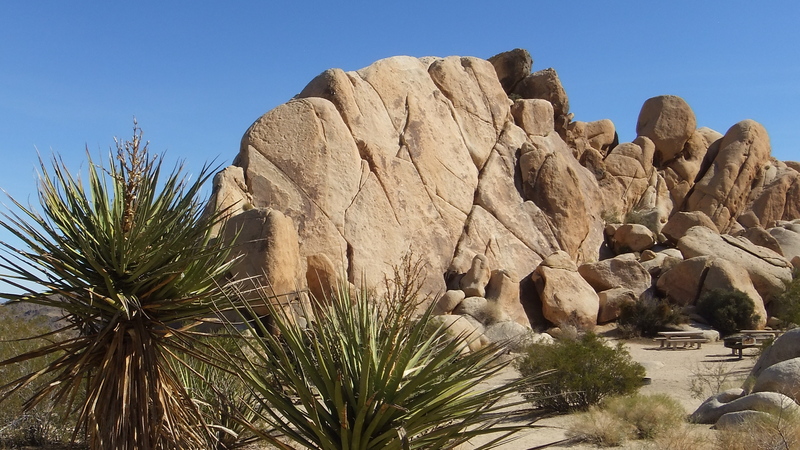 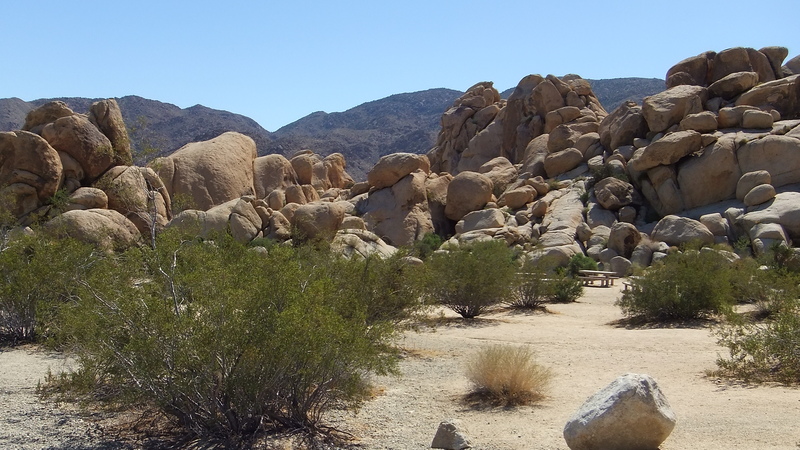 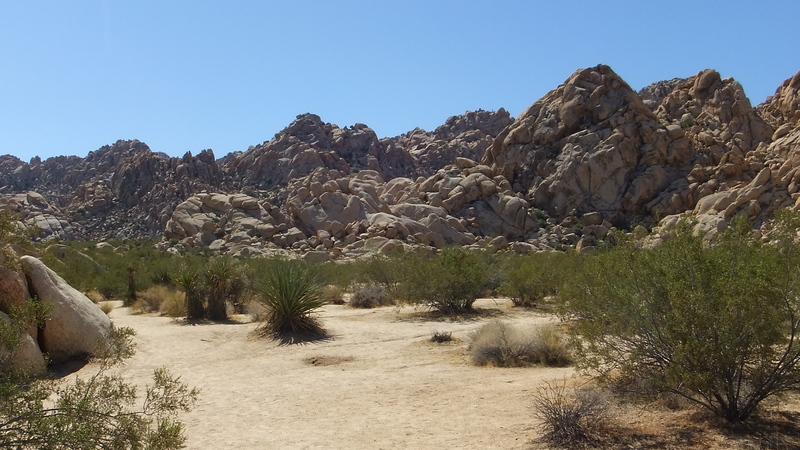 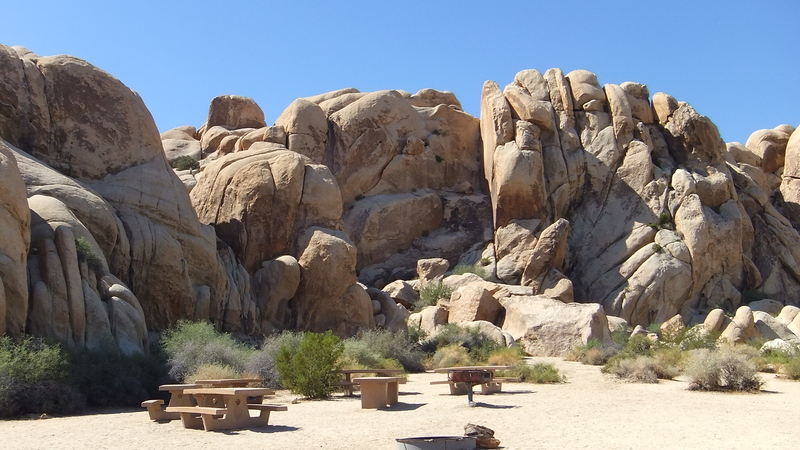 THIS LARGE JOSHUA TREE NATIONAL PARK CAMPGROUND has campsites around the bases of rocky formations and smoother inselbergs, tucked away in rocky coves, with some even rising on the edge of wide-open plains. 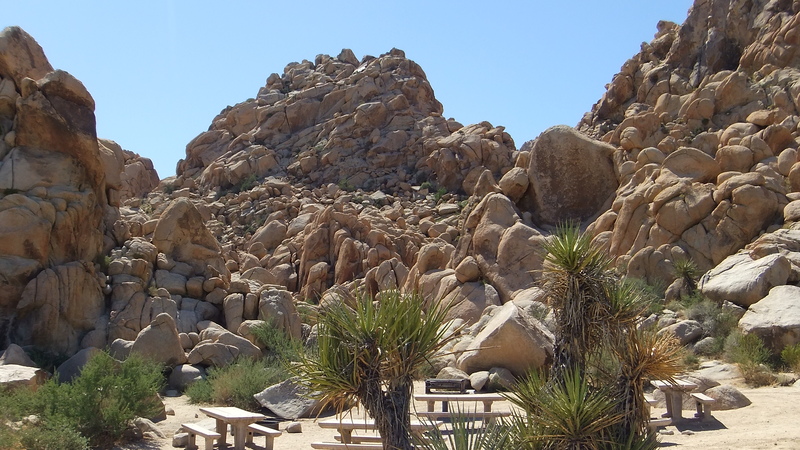 The Indian Cove grounds offer both group and regular occupancy sites. 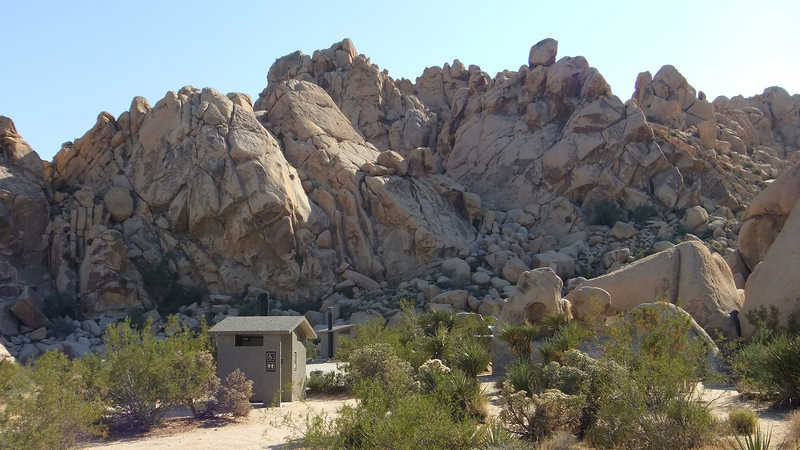 Two miles south of the ranger station is Indian Cove Campground. 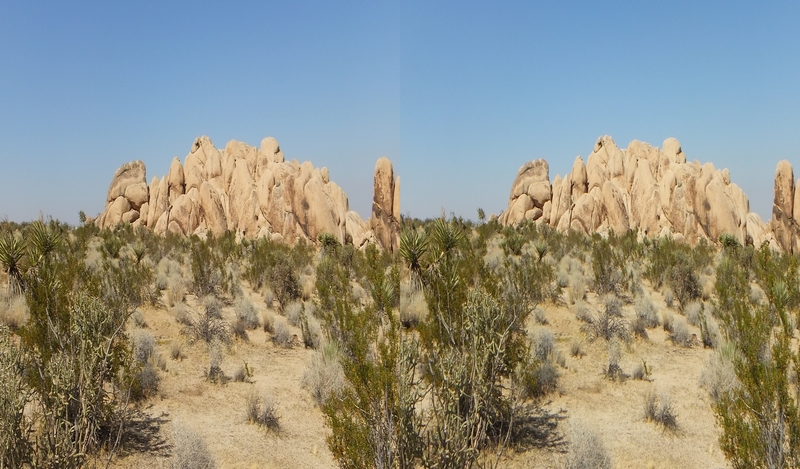 Just before the main campsite entrance, on the right, is the turnoff for the group campsites (with 13 sites). 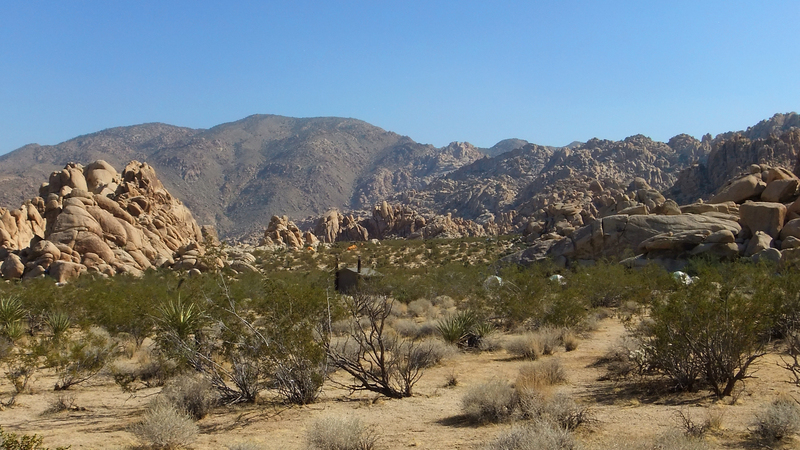 The regular campground has 101 camp sites and lies straight ahead. 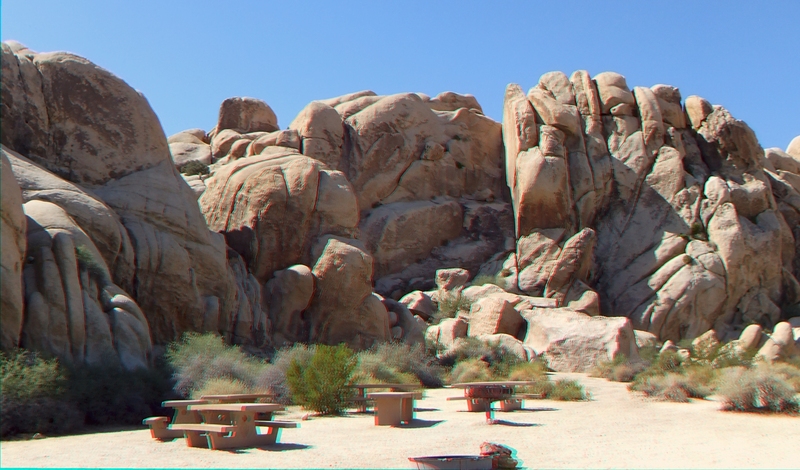 Daytime visitors who do not plan on reserving a Group Campsite can park at one of two Public parking areas. 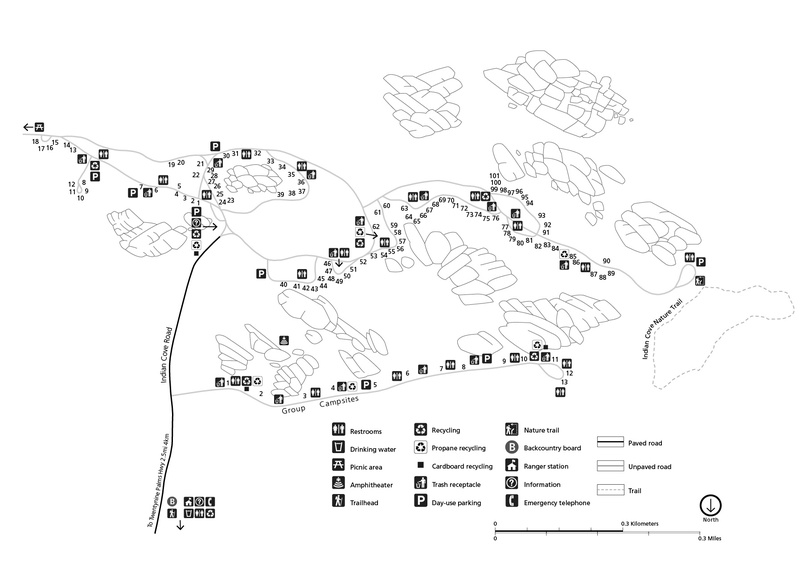 The first is between Sites 4 and 5, and the second at Site 8. 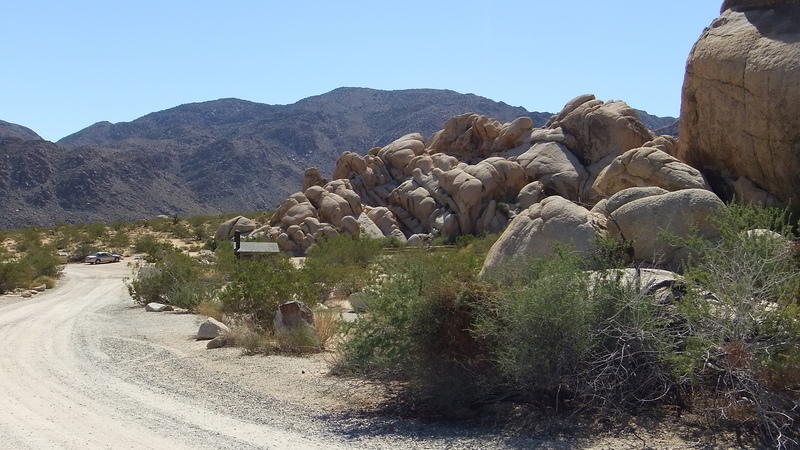 They can be identified by the No Parking 10PM to 6AM signs posted—meaning that these are free to use during the day. 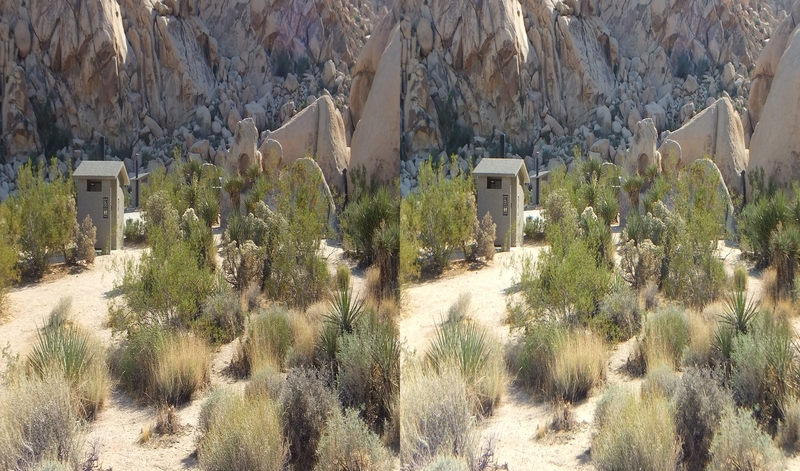 There are restroom facilities available near both. 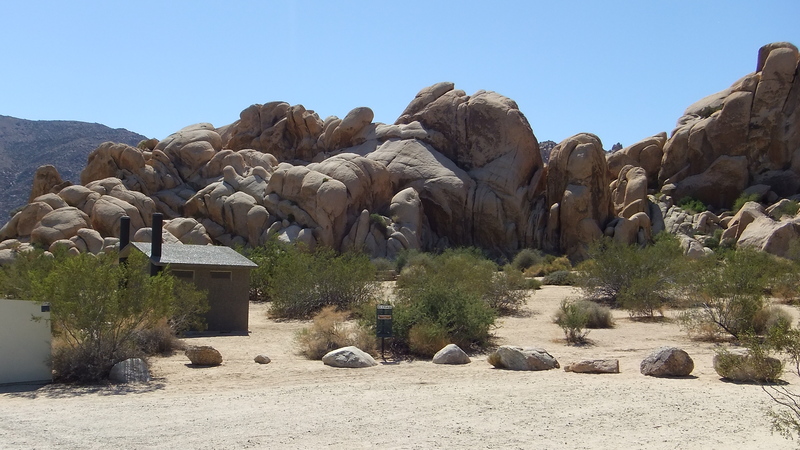 Although there is no water within the campground, potable water is available two miles south at the Ranger/Entrance Station. 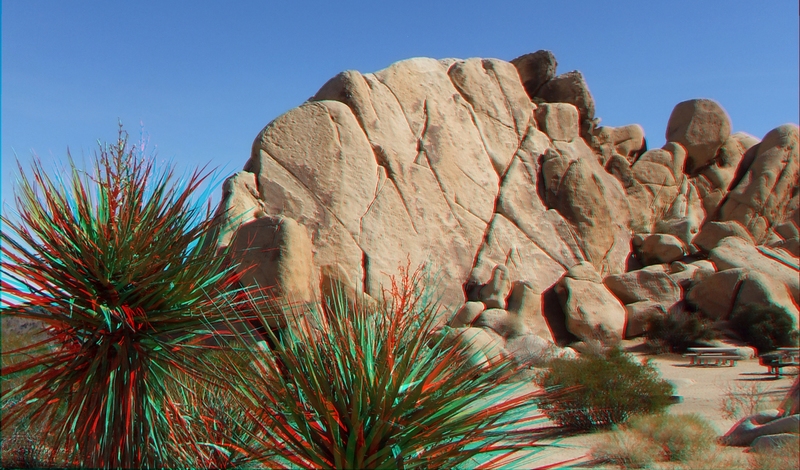 Stock up ahead of time. 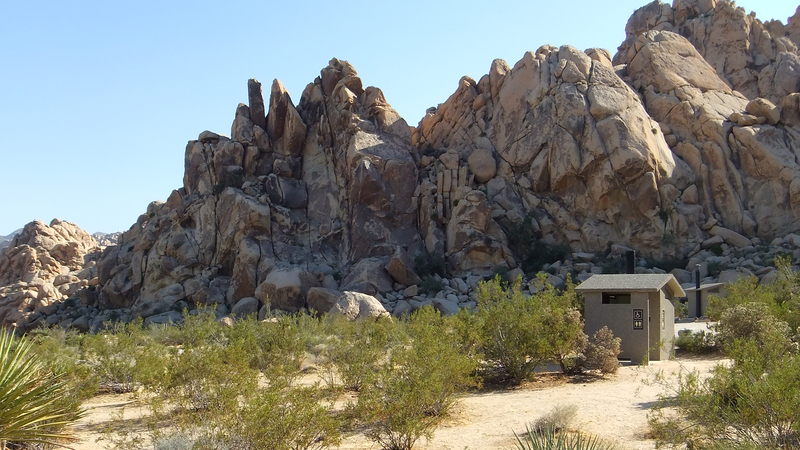 Group Camp Wall #1 on left. 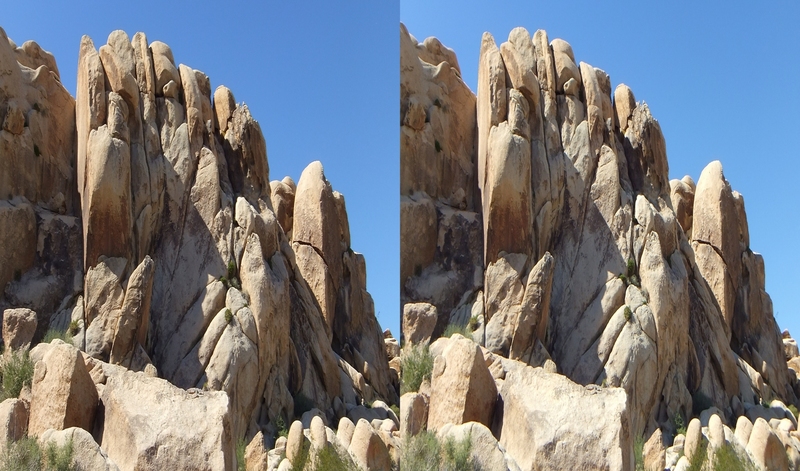 Wall #2 (cracked pillar on right behind site 2). 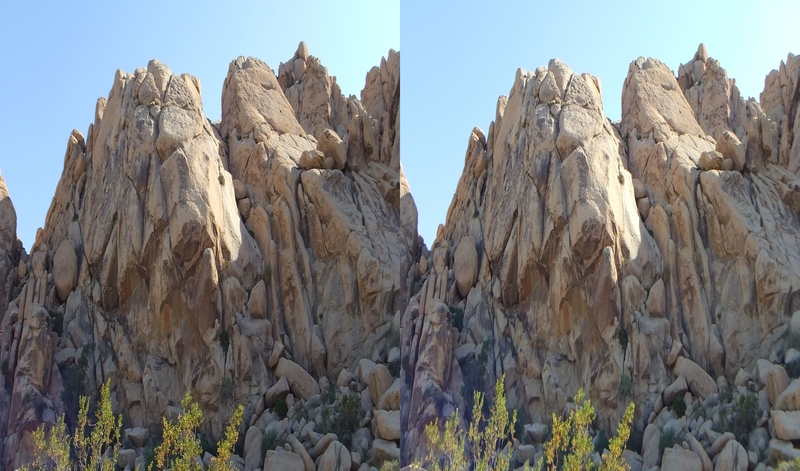 Mountainproject.org describes Wall #1 this way: “It’s north facing and characterized by several vertical cracks running up the face and a big flat slab on the left facing East. 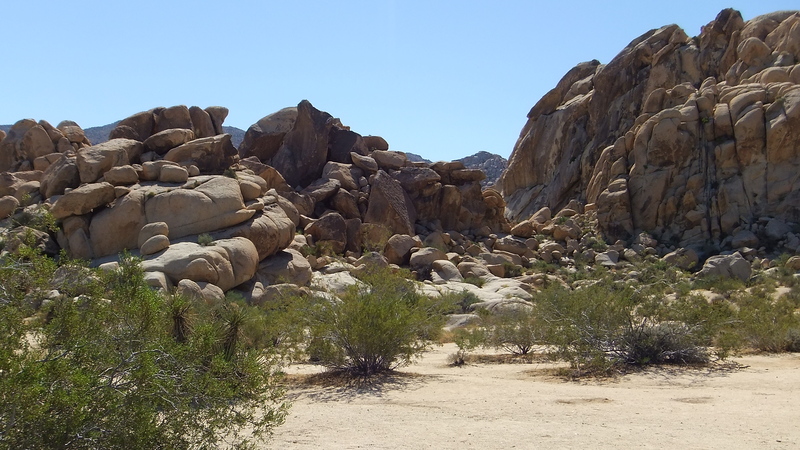 This area gets shade in the afternoon. 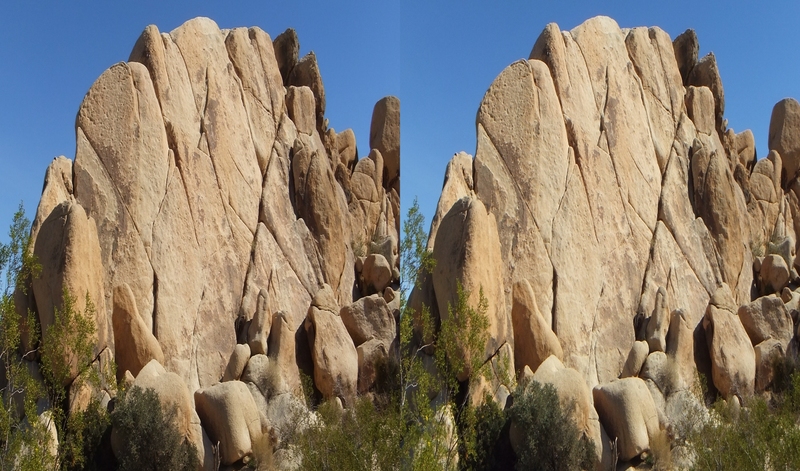 Miramontes, in his recently published book, describes the right-hand block as Wall #2. 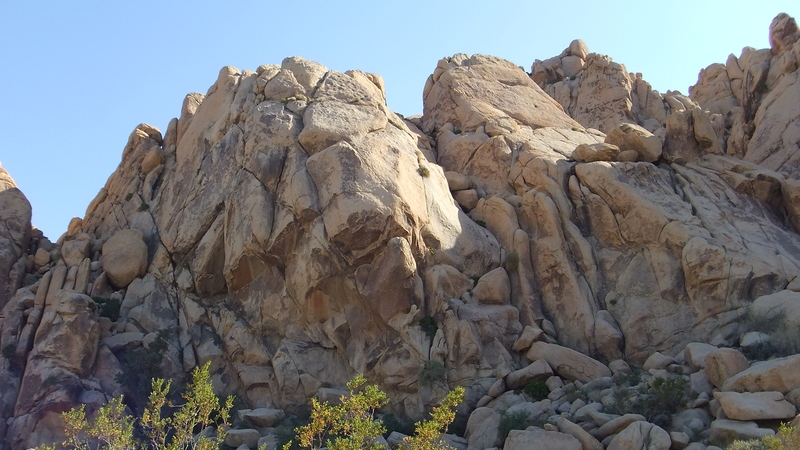 Germanic made-up names comprise this wall’s climbing routes: “Klettervergnugen,” left of the pillar; on the pillar itself, “Blitzkrieg” which has 5.12a difficulty ranking & three stars, and “29 Bombs,” rated 5.11a**. 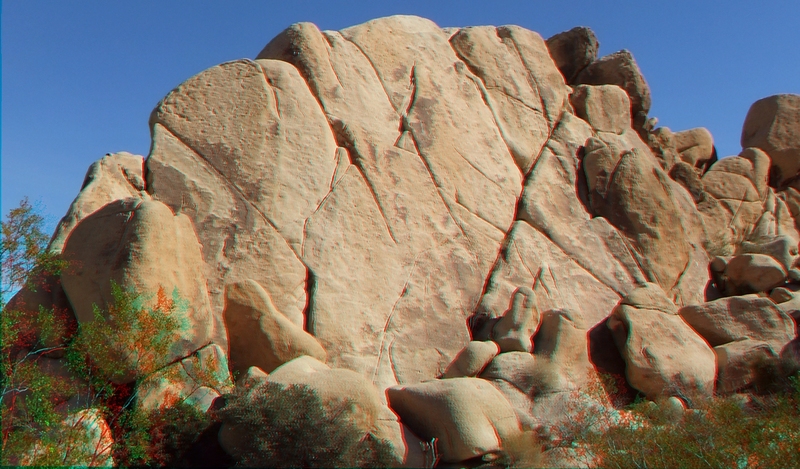 Lastly, “Katoomba” is found on a pointy boulder further right. 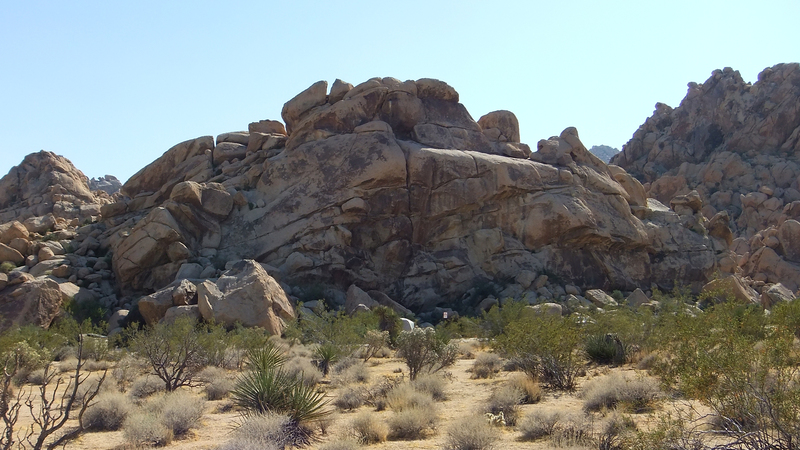 Hodpodge Rock at center of Group campsites 4, 5 and 6. 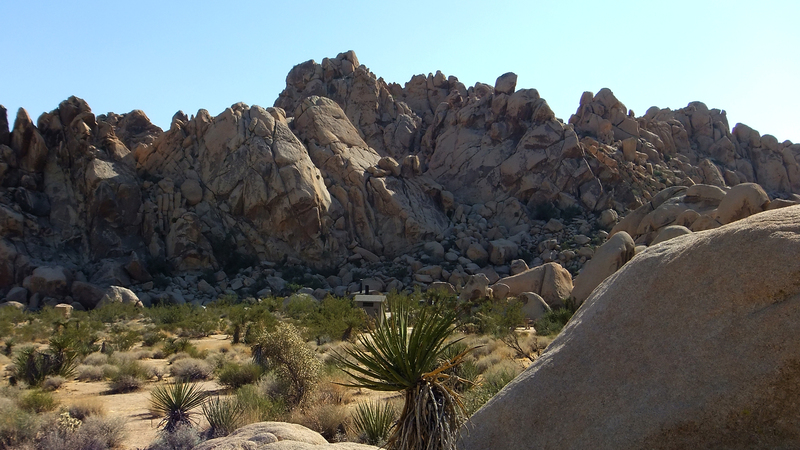 The taller Campfire Crag beyond. 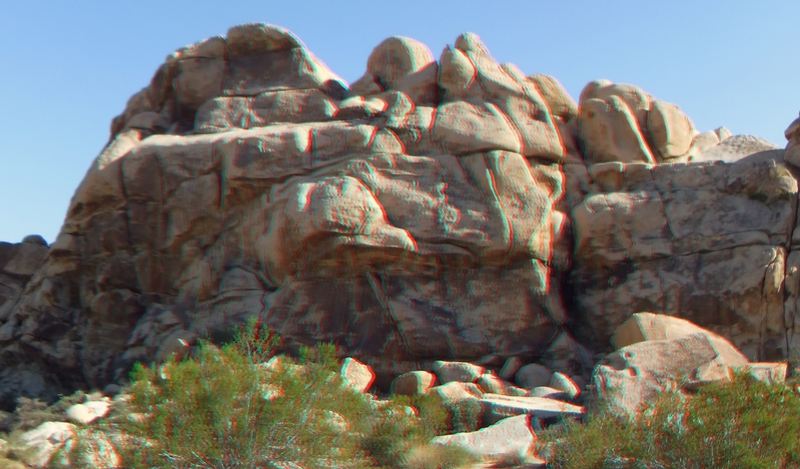 Shot from the Grain Silo out on the plains. 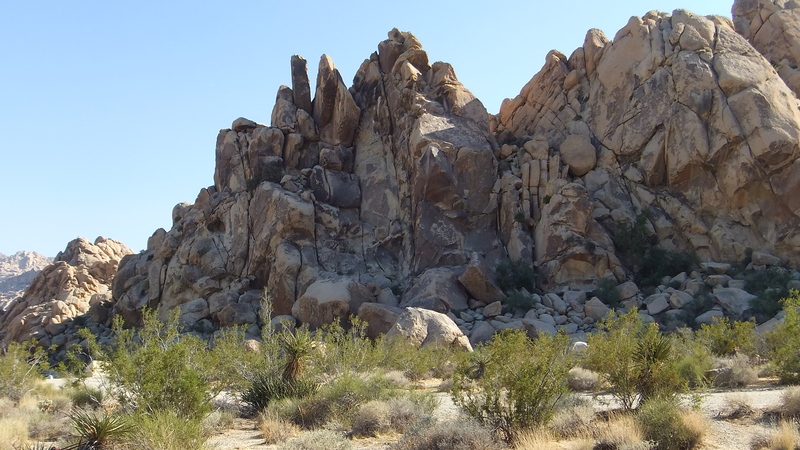 Hodgepodge Rock. 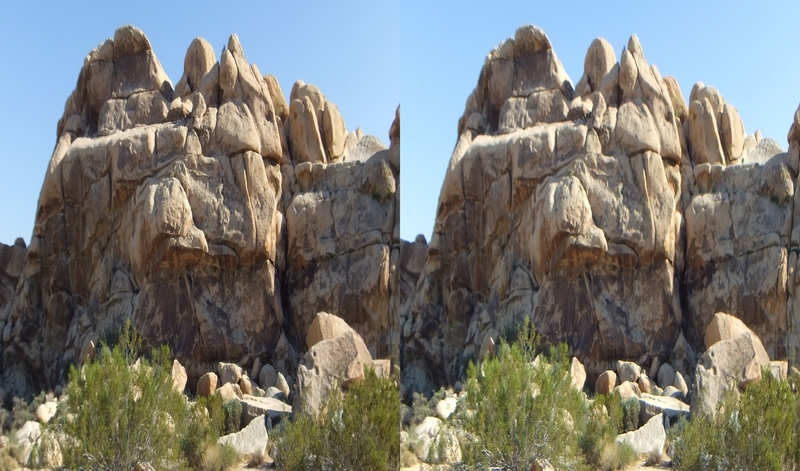 North face (above). 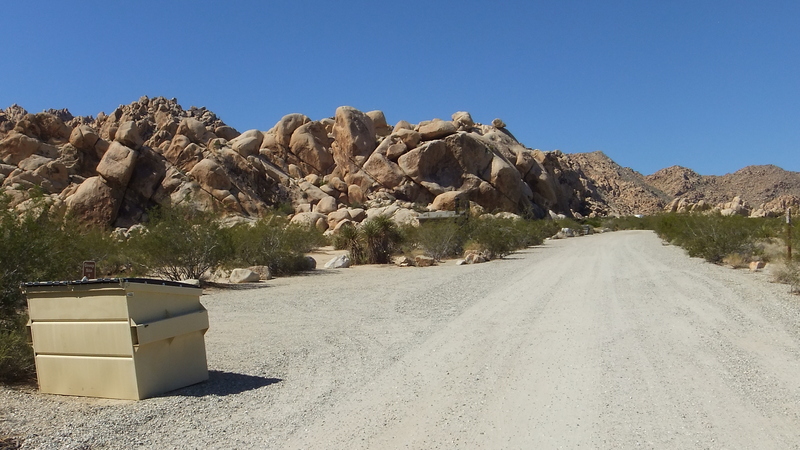 This bucketed face lies just south of the road about 10 feet on the left. 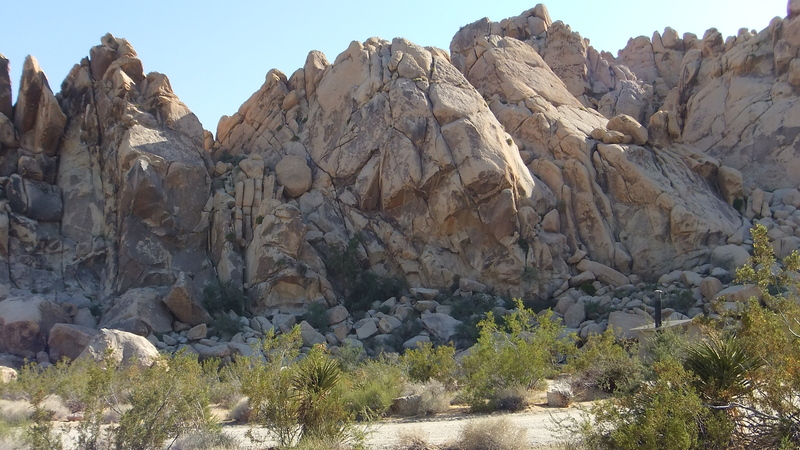 Hodgepodge truly is that, with numerous climbs on both the north and southwest faces. 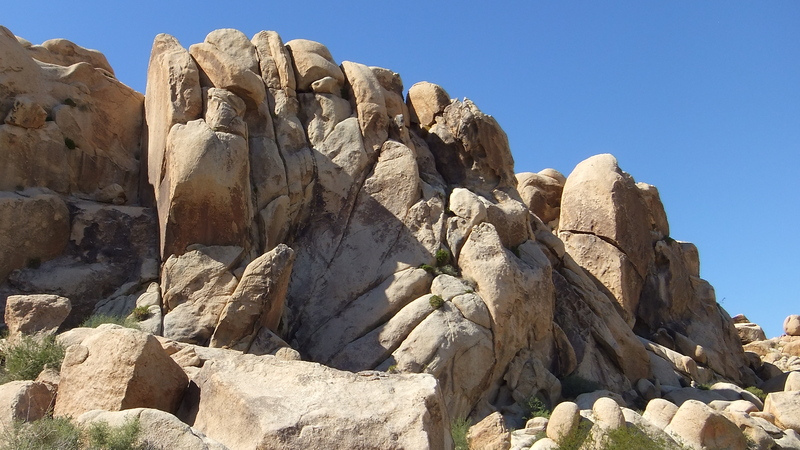 Routes include: “My Wife is an Alien,” “Hodgepodge,” “Ligamentor Seconds in Vans,” “Hot Tub Honey,” and “Unconscionable” on the side facing north. 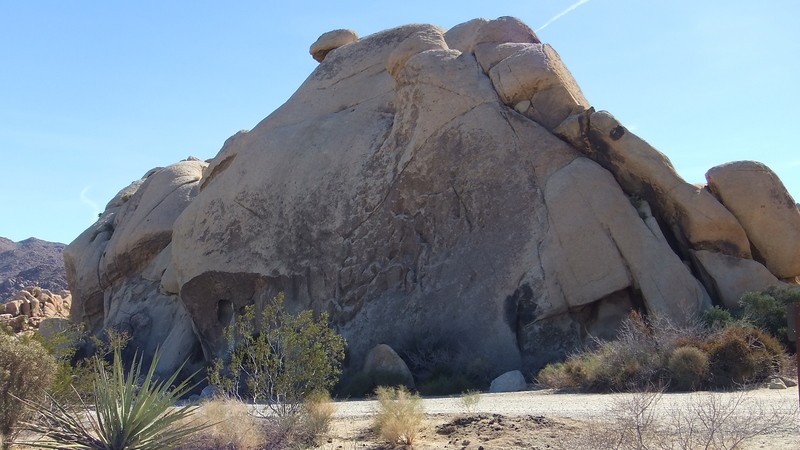 With easy, 40ft to 45ft climbs like “Locknoob Monster,” “Hedgehog,” “Hogback,” “Tumbleweed,” “Bakersfield Bomb,” “Briar Rabbit,” “Bittersweet,” and “Semisweet” among others, on the southwest side (see below). 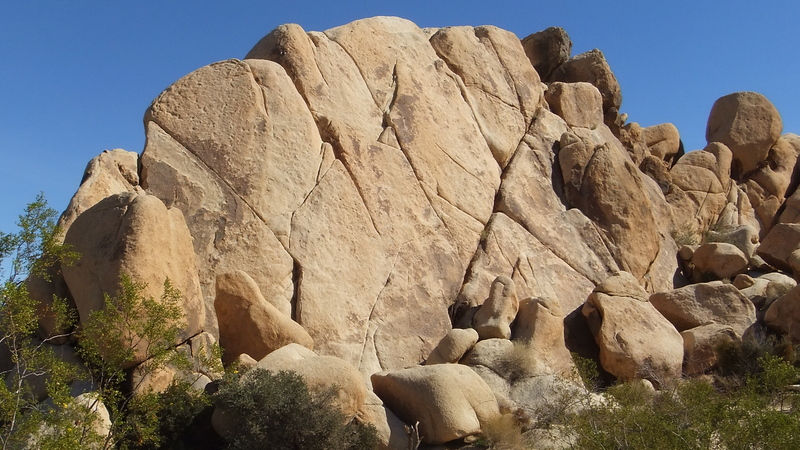 Hodgepodge Rock, an end-on view. 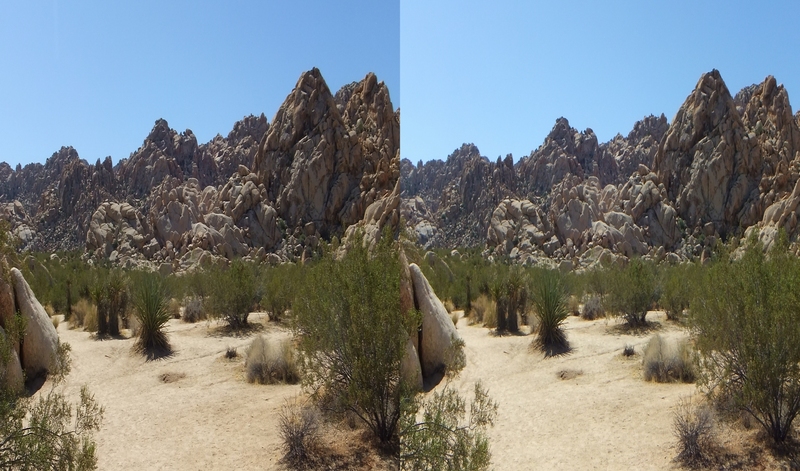 North side is shady most of the time. 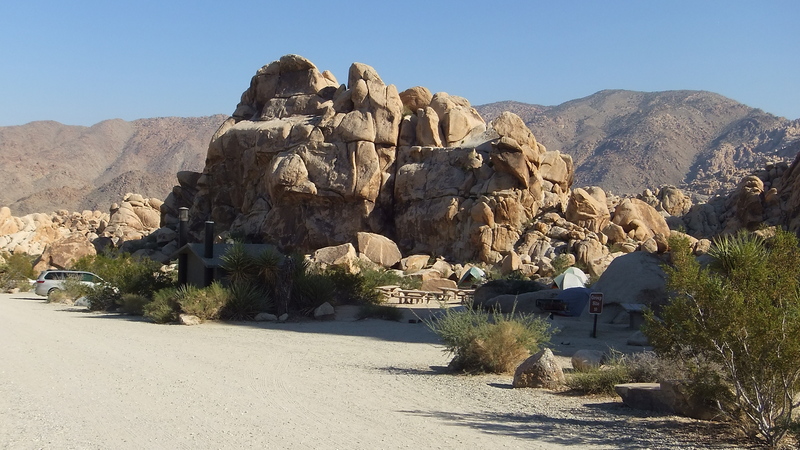 The cars are parked at campsites 5 and 6. 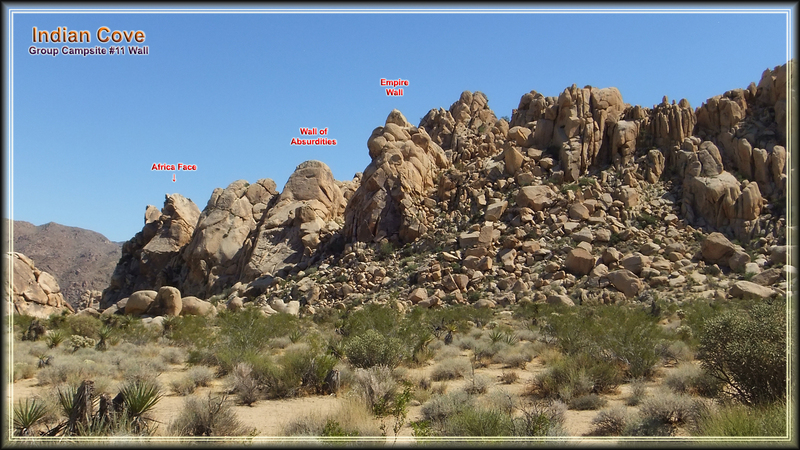 The open area at right allows easy access from sites 5-to-8 to the Campfire Crag area (tall formation rear of Hodgepodge), as well as access to the further destinations near Center Crag/King Otto’s Castle formation at back right. 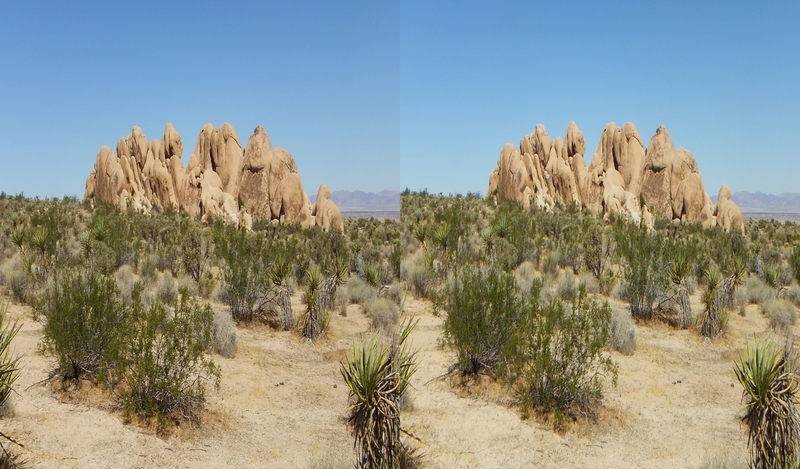 Way on the distant hillside is Rattlesnake Canyon with its remarkable (but impossible to get to if you are a sane person) climbing formations. 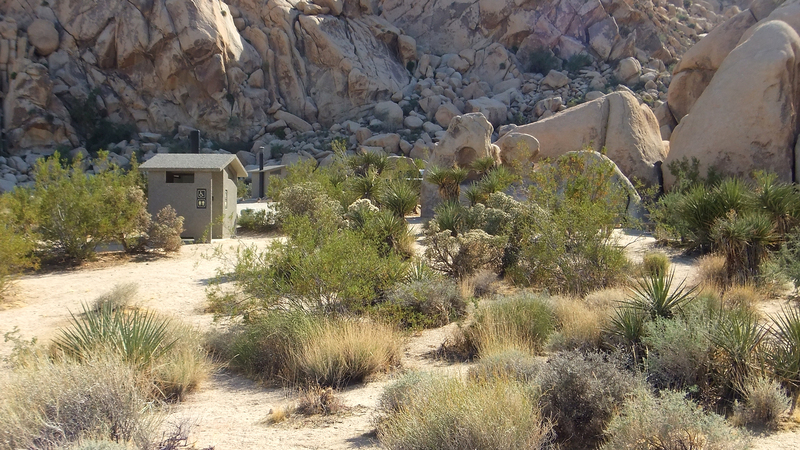 From the more open areas beyond campsites 5 to 7, the theme switches on a dime, and dramatically, once past the restroom facility that serves campers 7 & 8 (on the left in this photo). 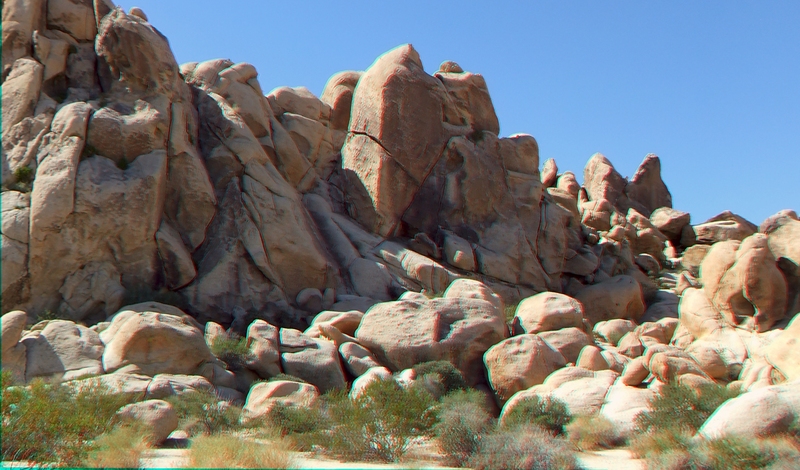 As you can see, large rocky hills intrude and block the view of the distant Wonderland of Rocks. 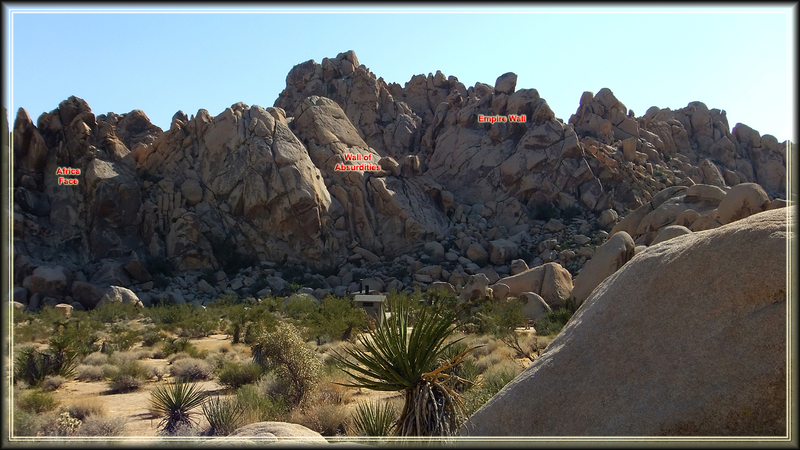 The next rock climbing feature: quite cleverly known as Group Camp #8 Wall, is the shady, north-facing wall on the extreme right. 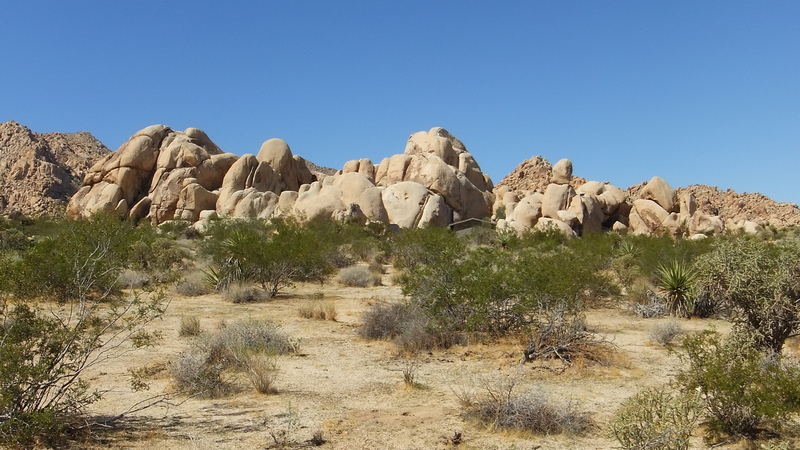 From this vantage in the Indian Cove Group Campground, the gently rising desert to the north reaches its acme point near a smallish formation known as (who knows why!) 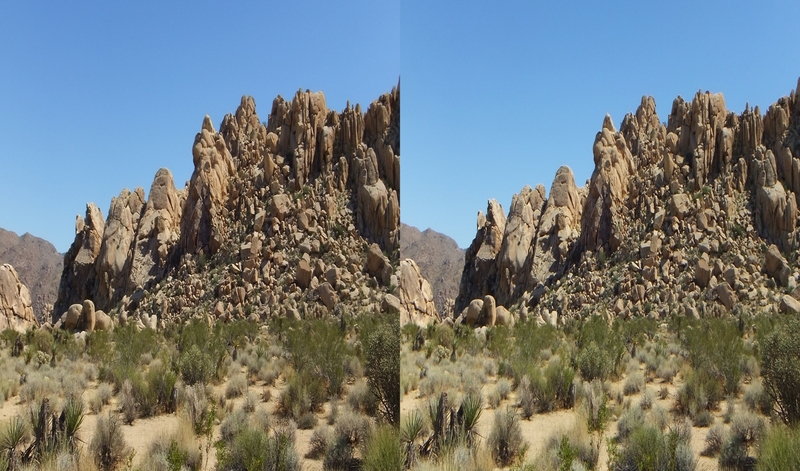 Valle de Duck. 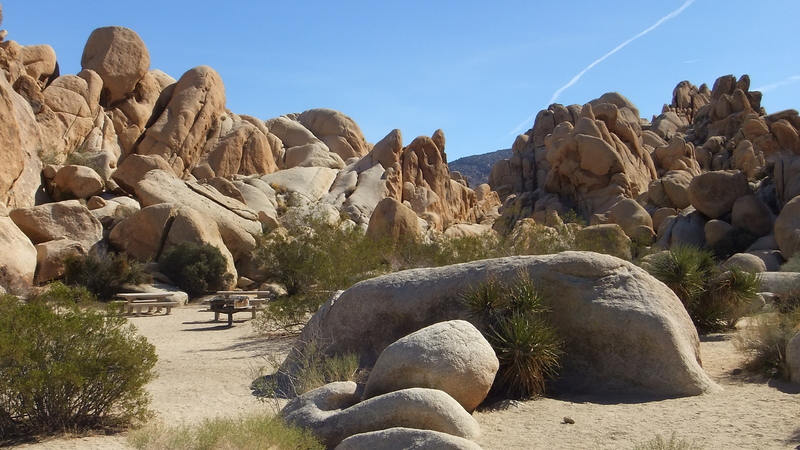 F.Y.I., Duck Valley, in English translation—along with its grander cousin Grain Central Station—will be discussed in Group Campsites Part 2, linked to above. 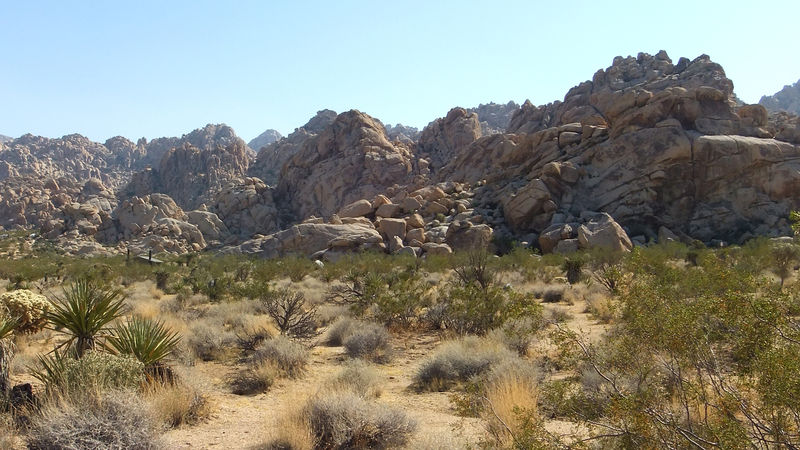 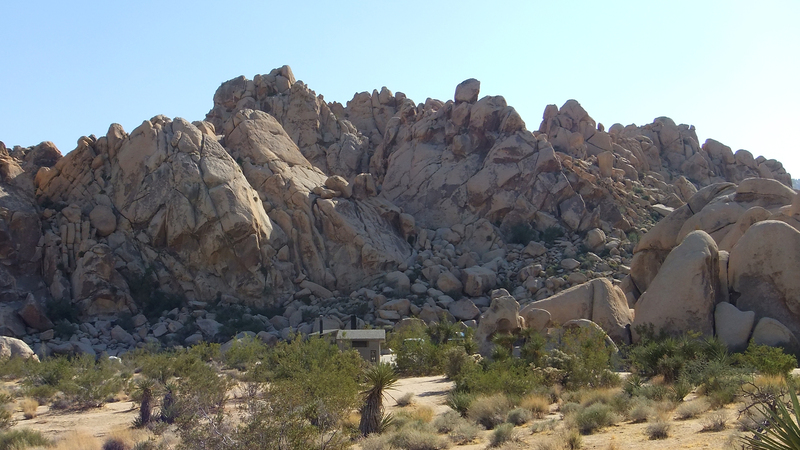 West sides of Hodgepodge Rock (left) and Campfire Crag (center), Group Campsites #5-8 area. 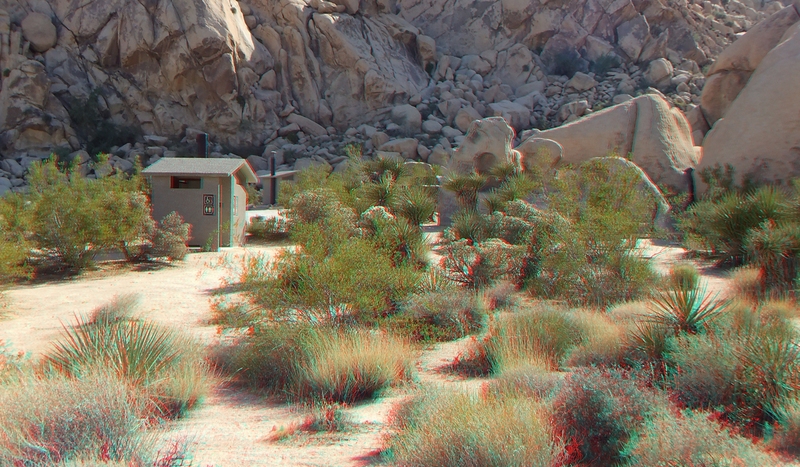 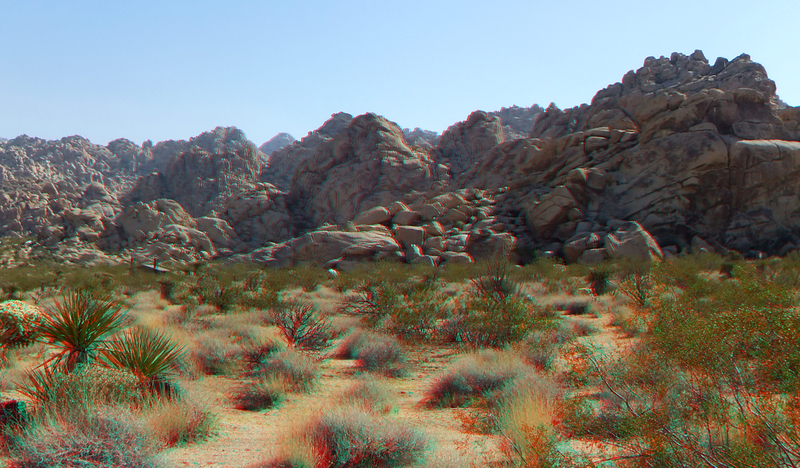 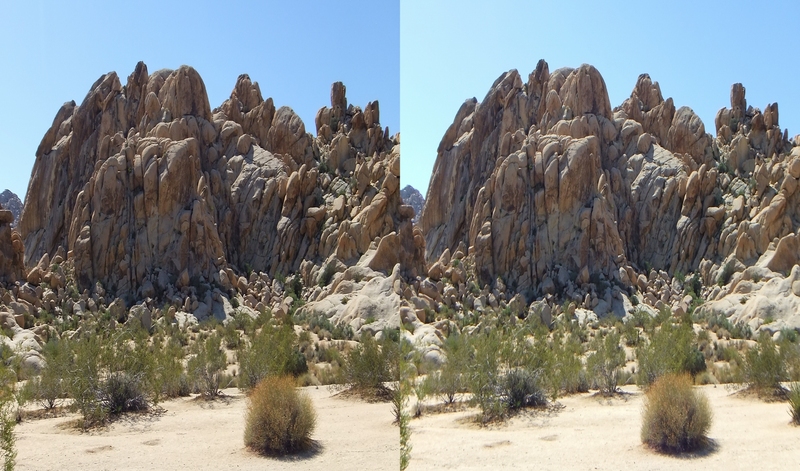 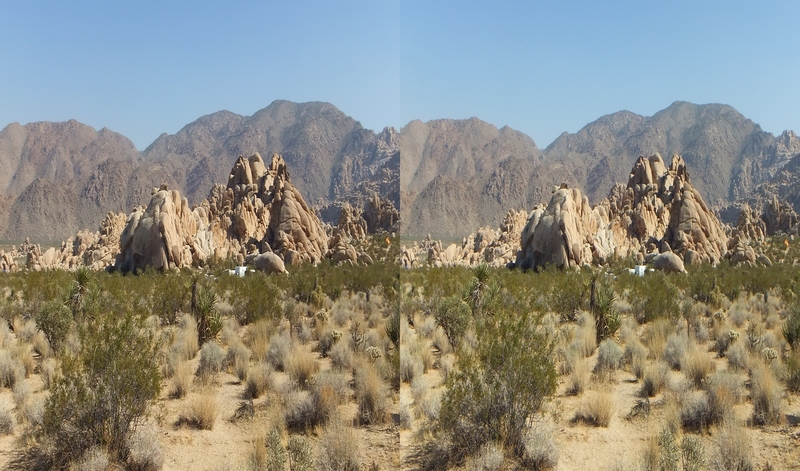 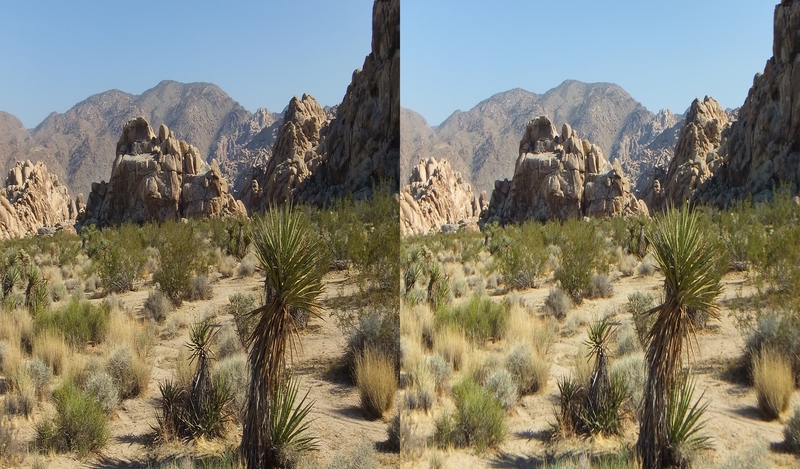 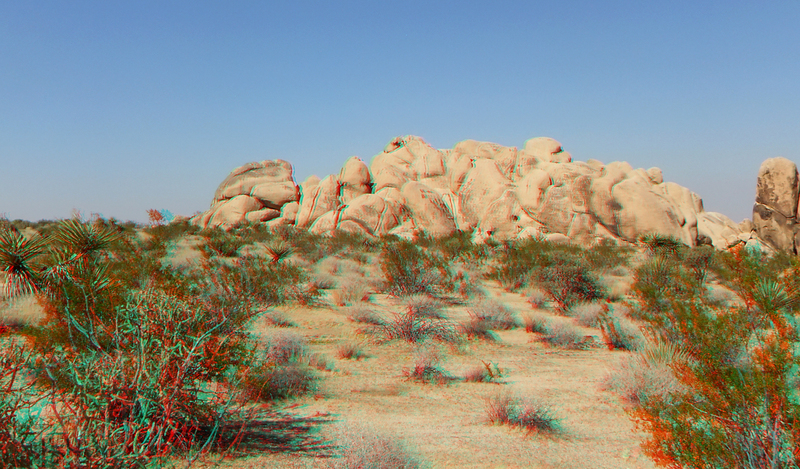 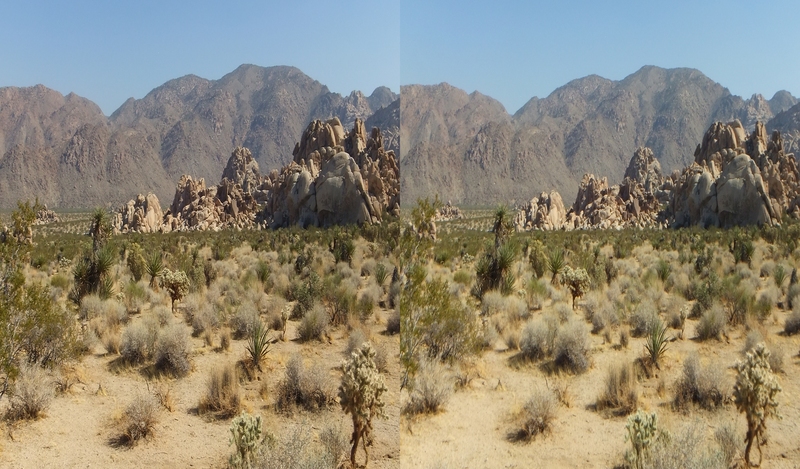 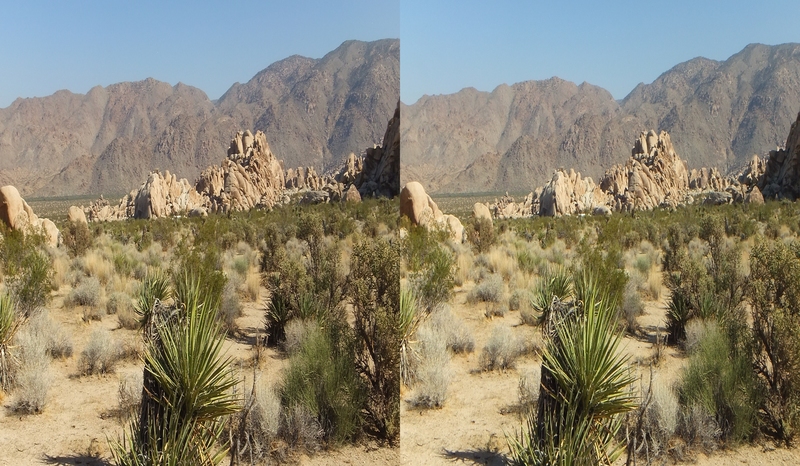 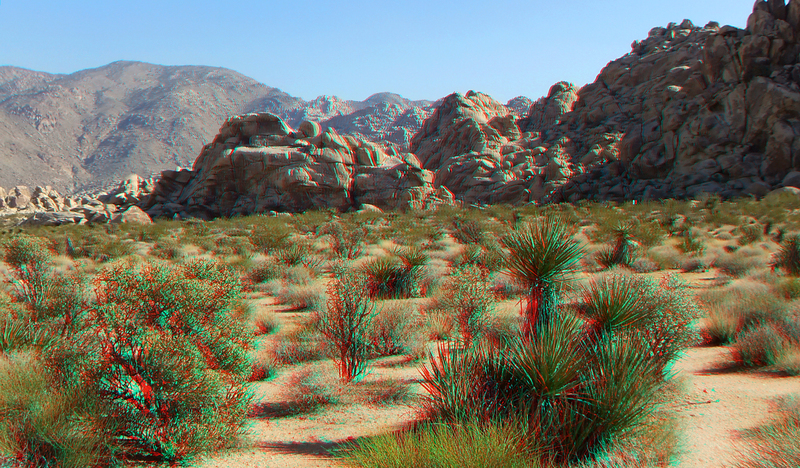 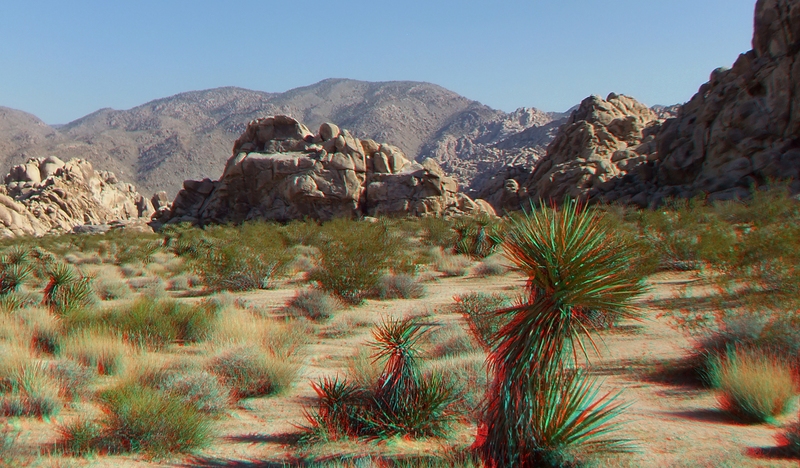 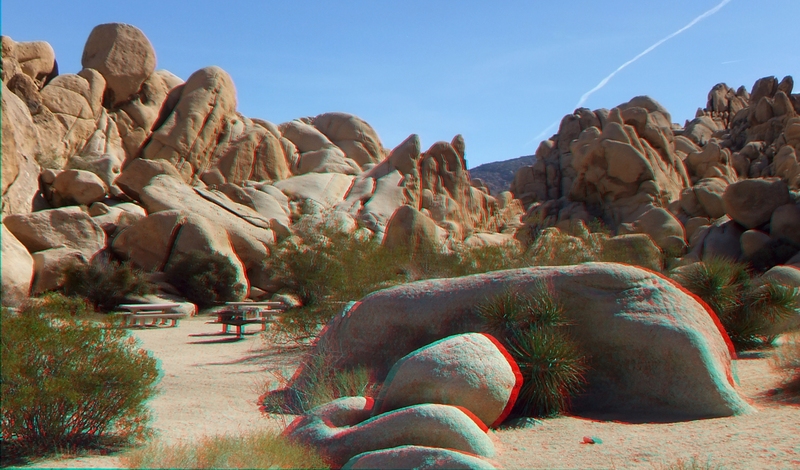 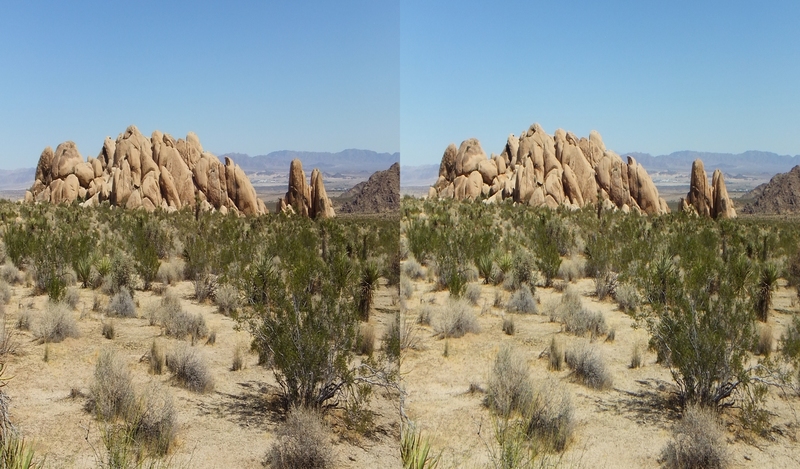 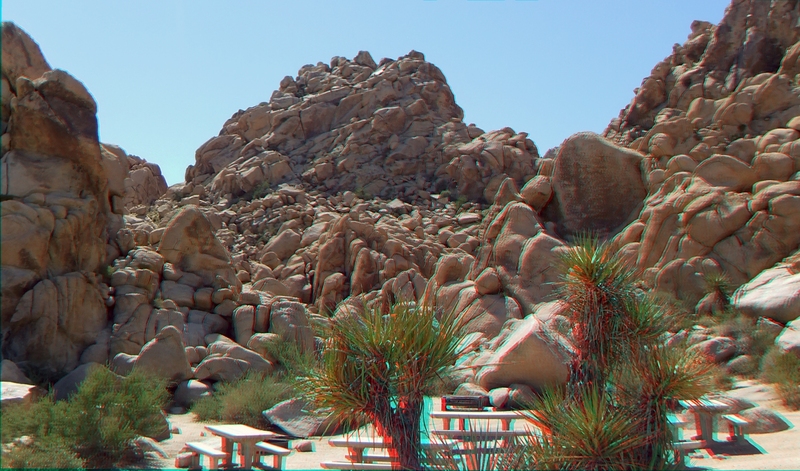 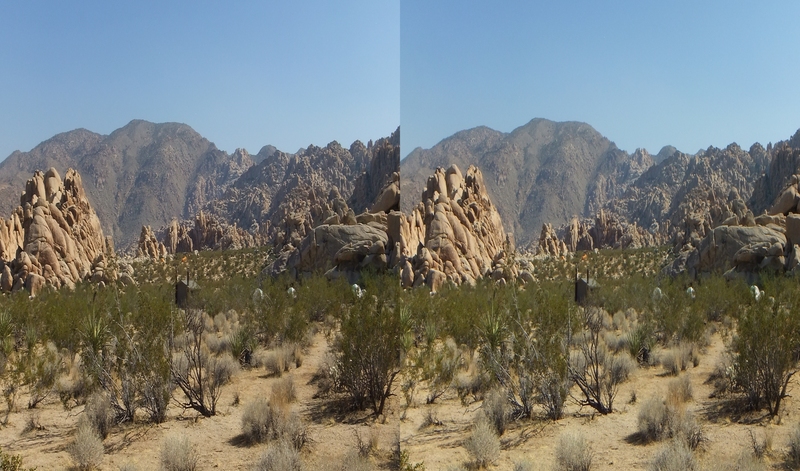 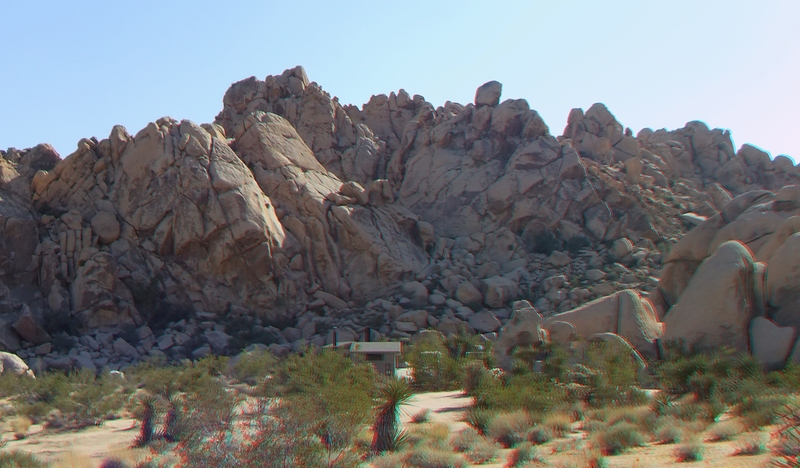 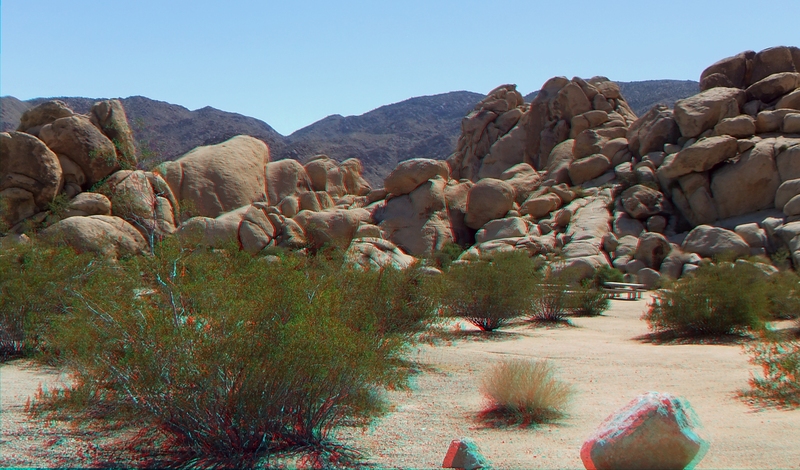 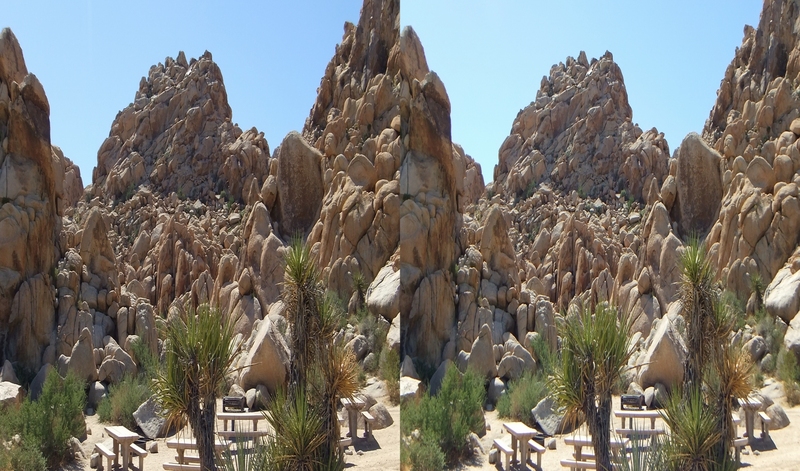 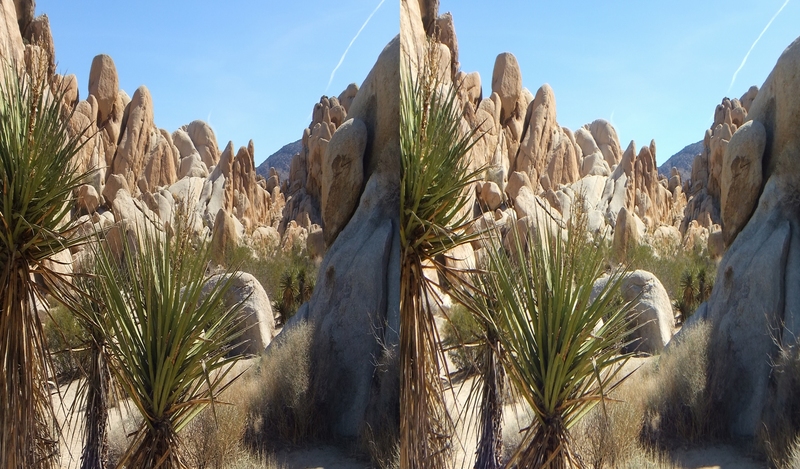 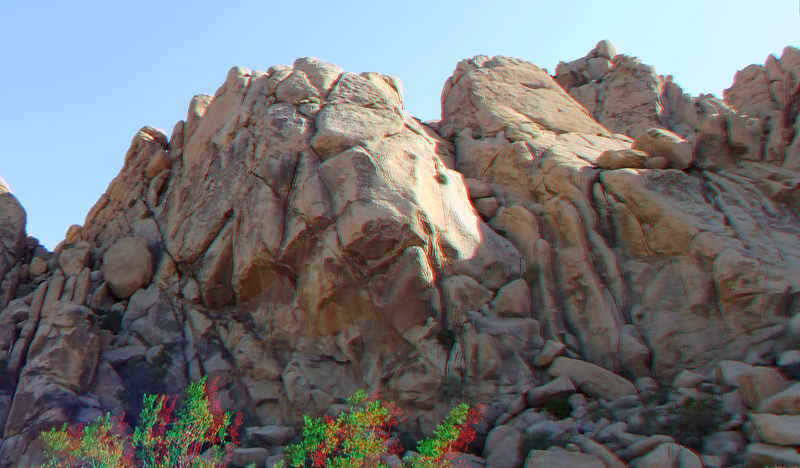 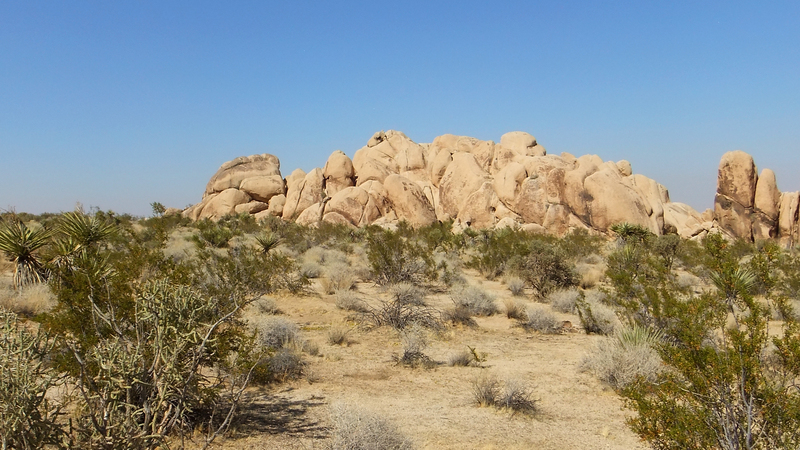 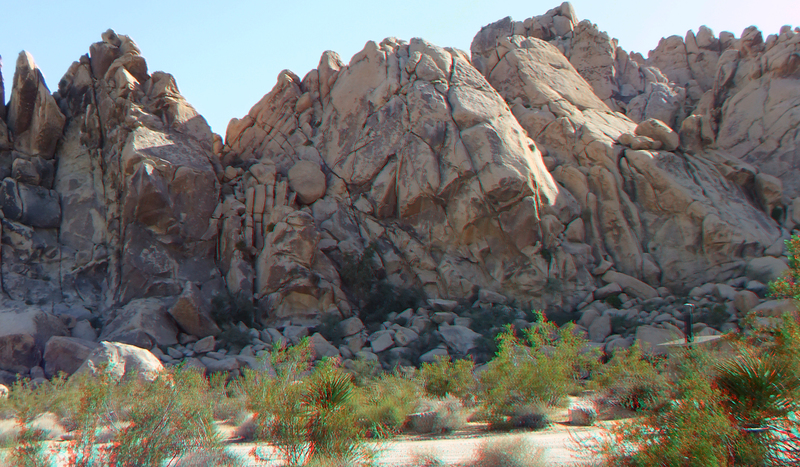 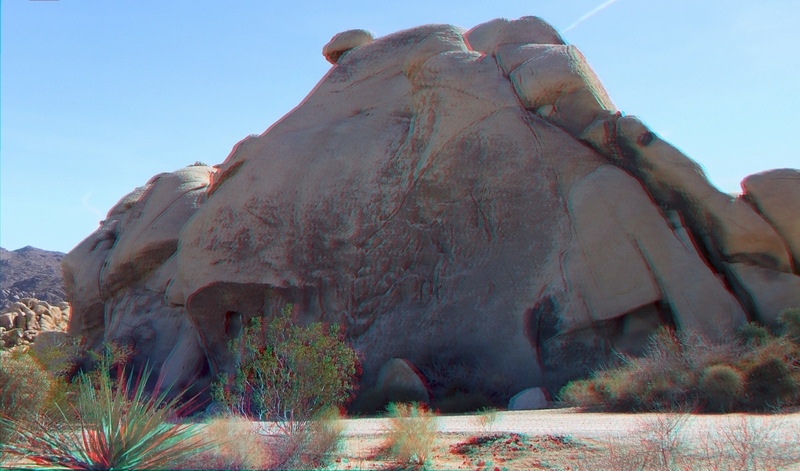 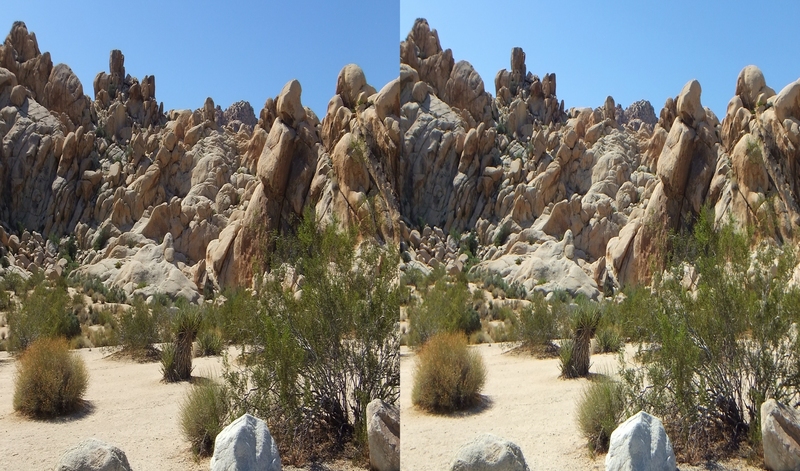 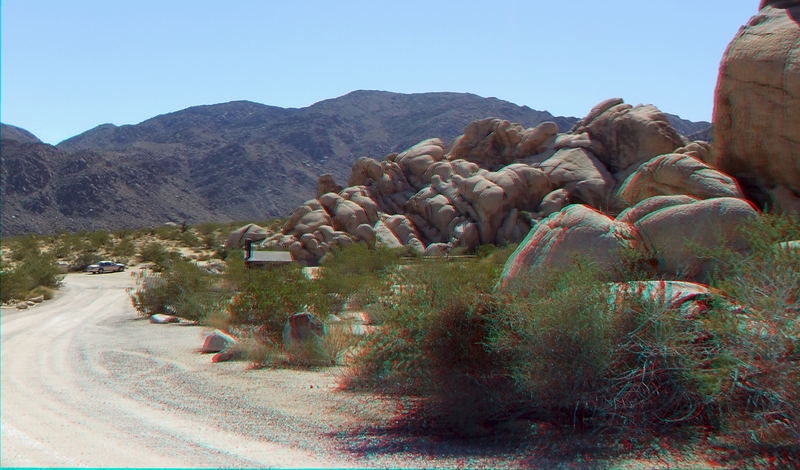 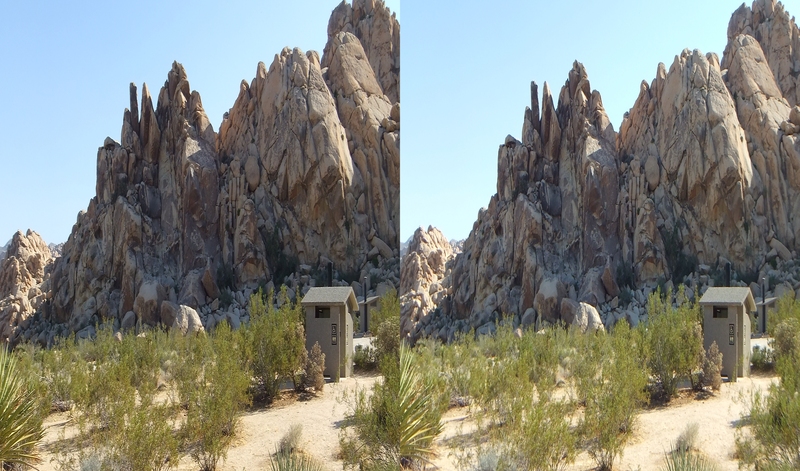 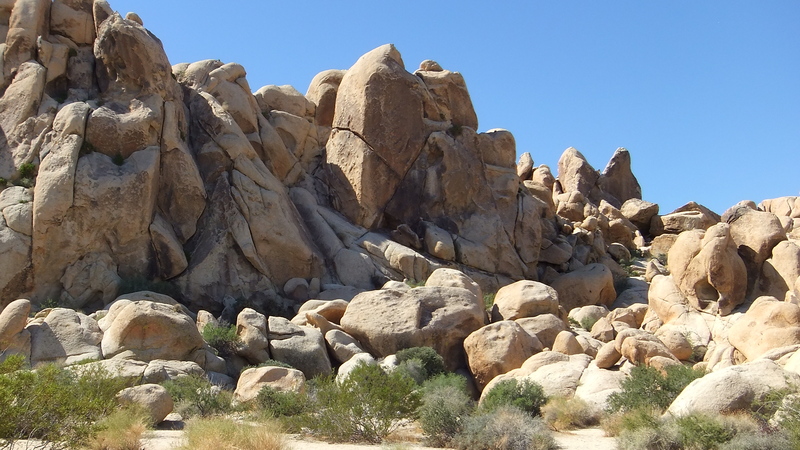 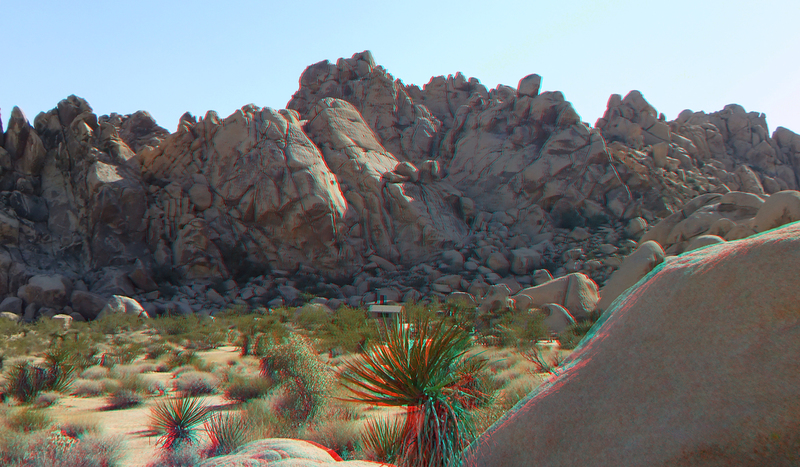 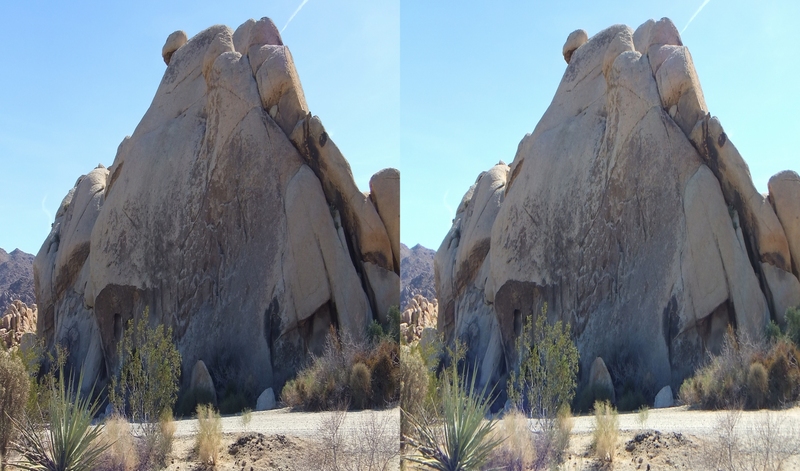 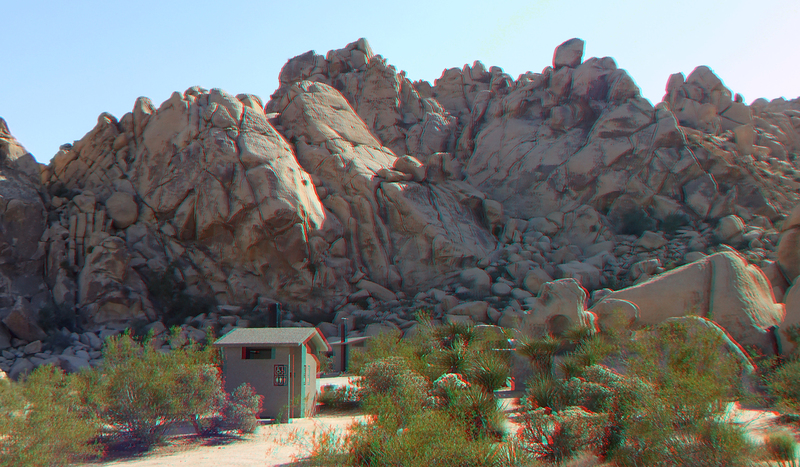 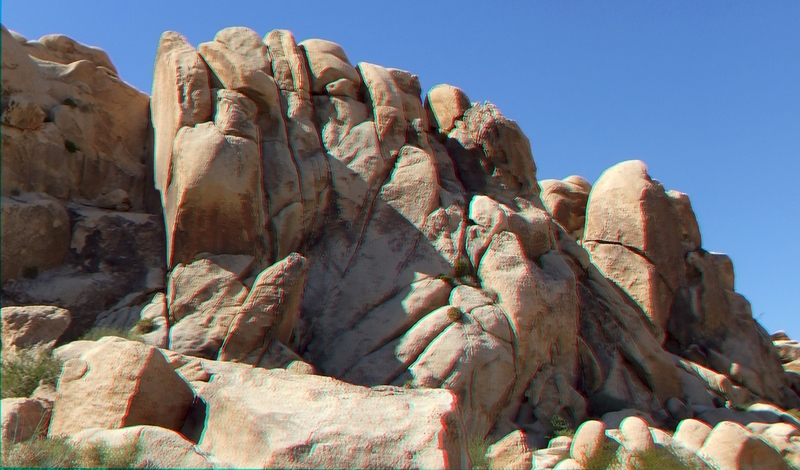 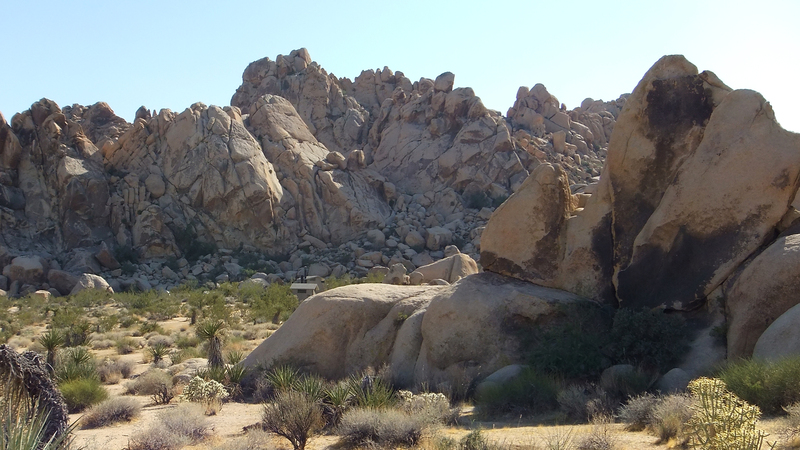 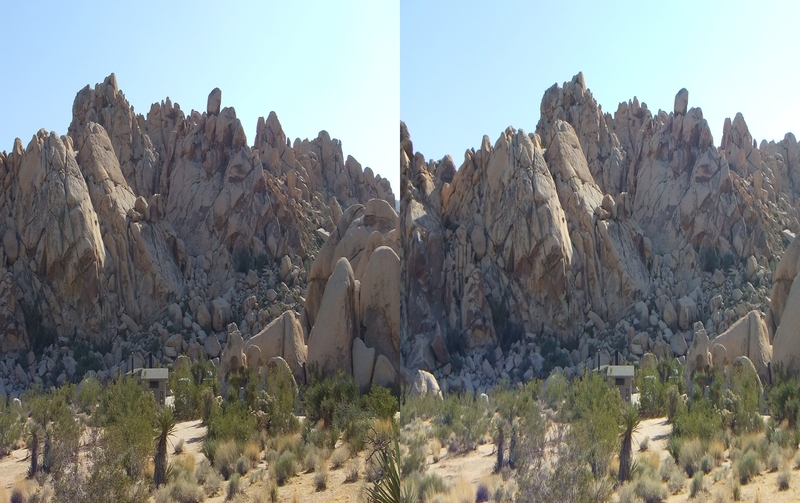 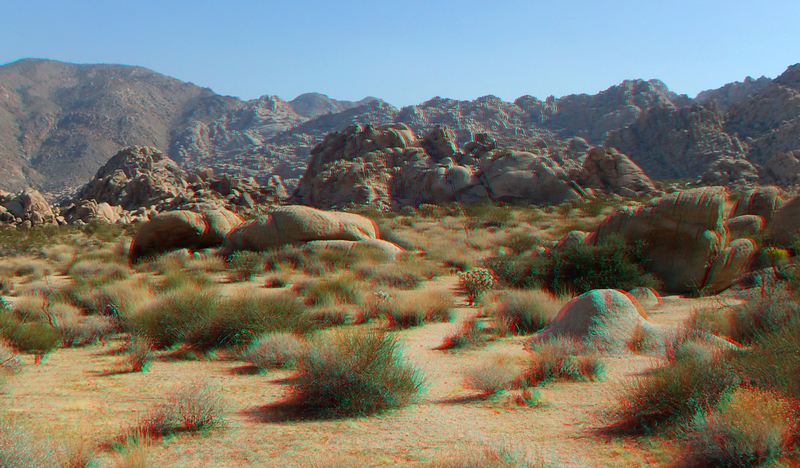 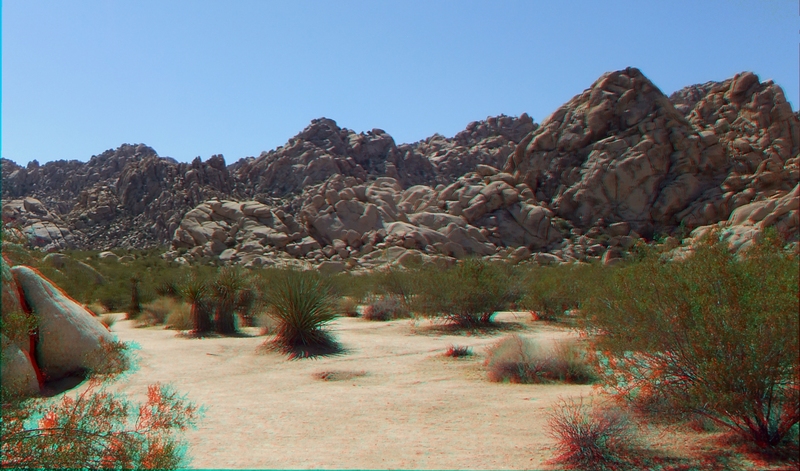 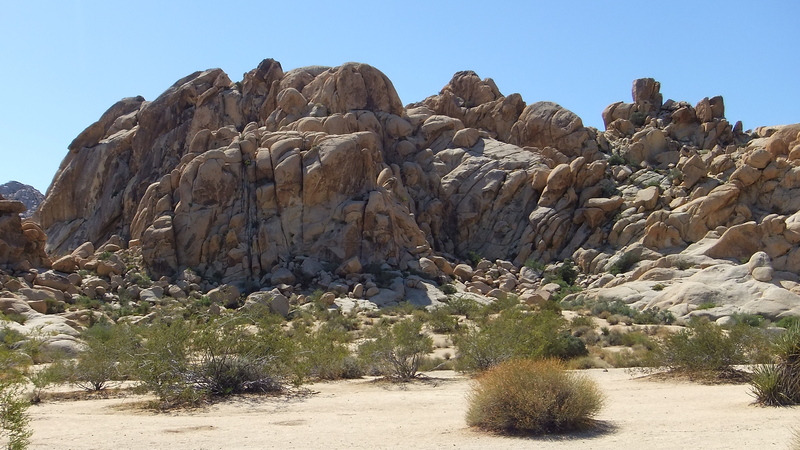 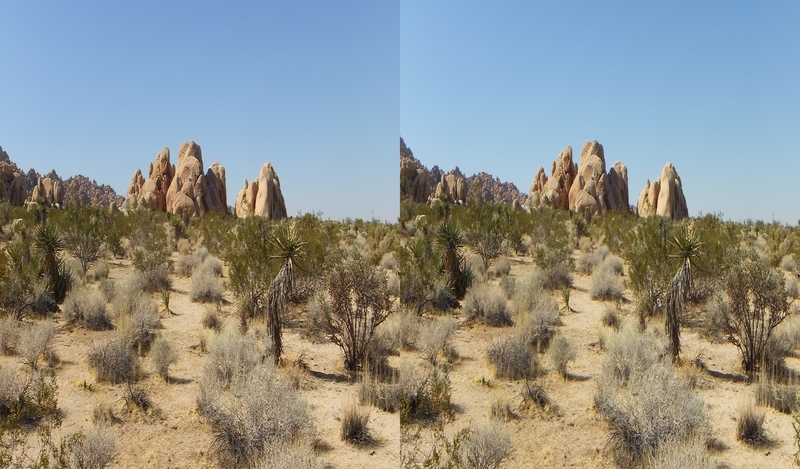 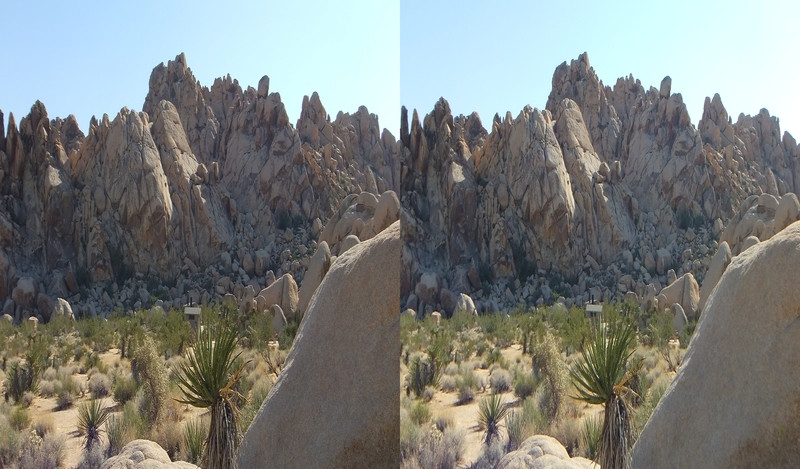 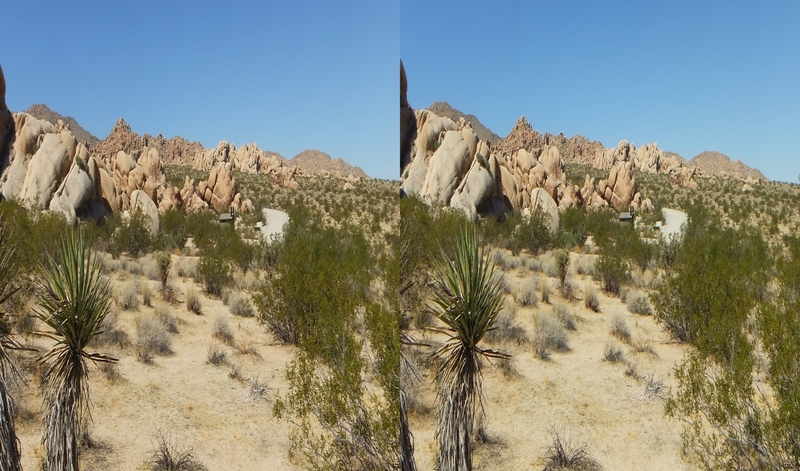 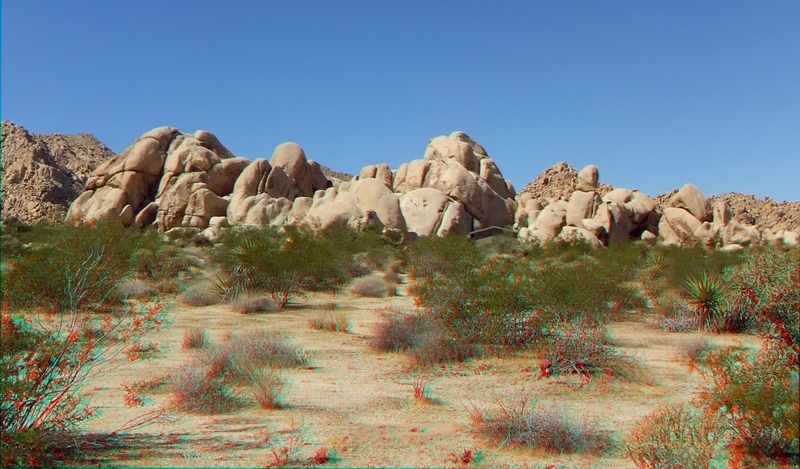 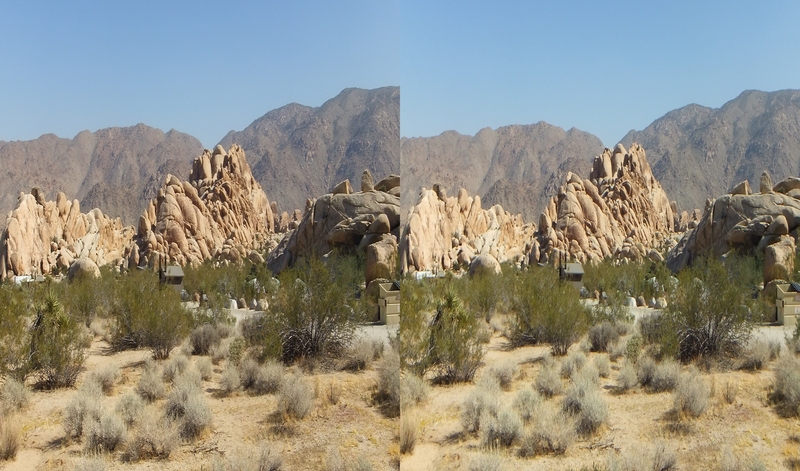 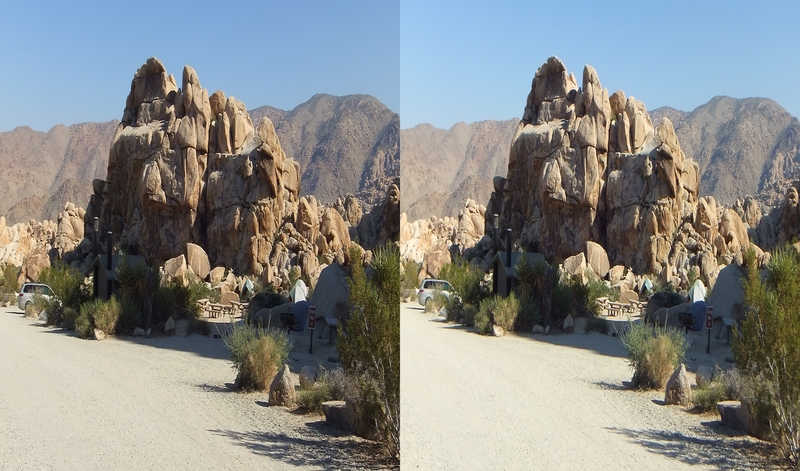 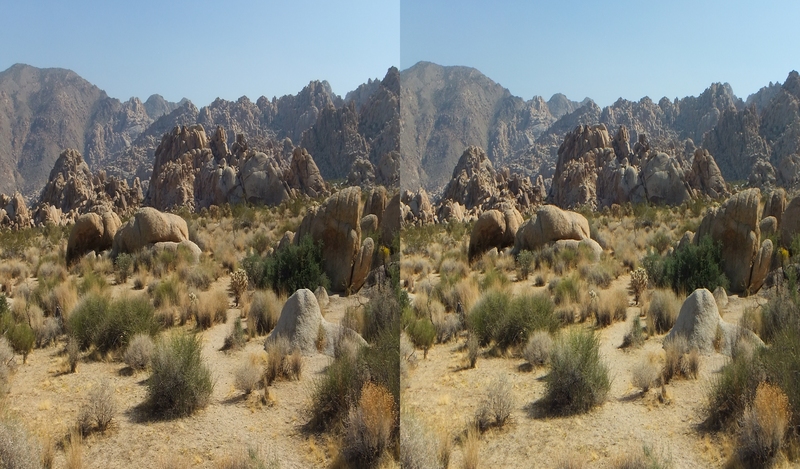 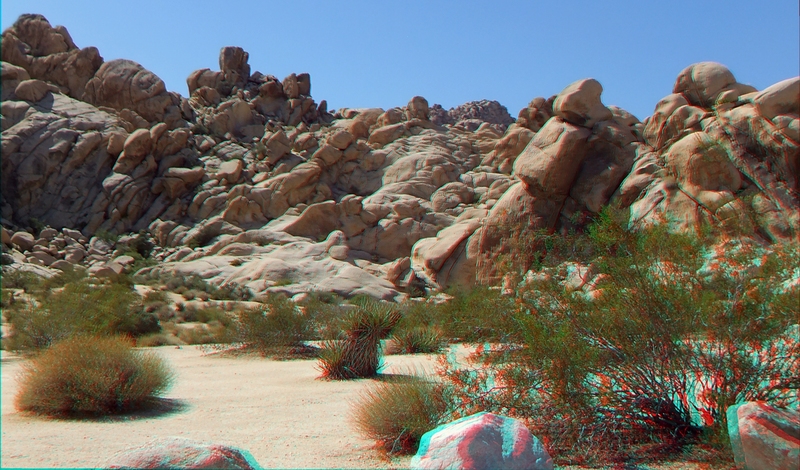 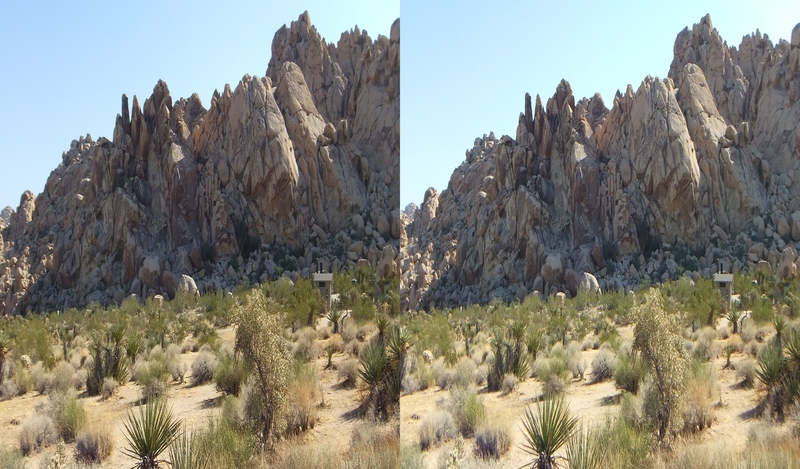 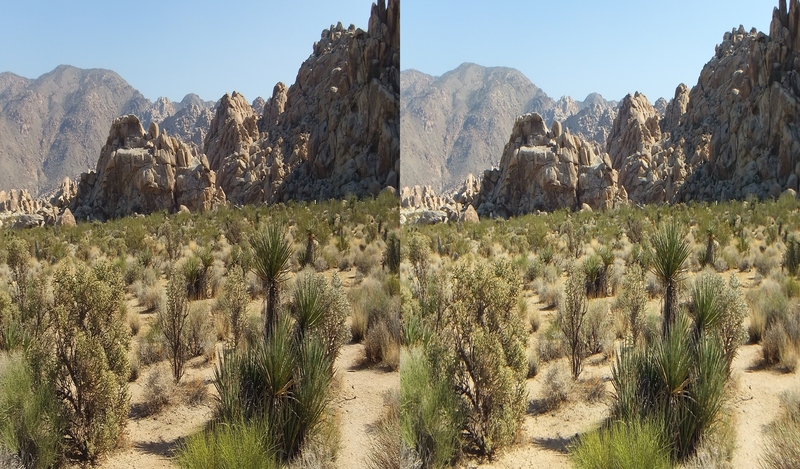 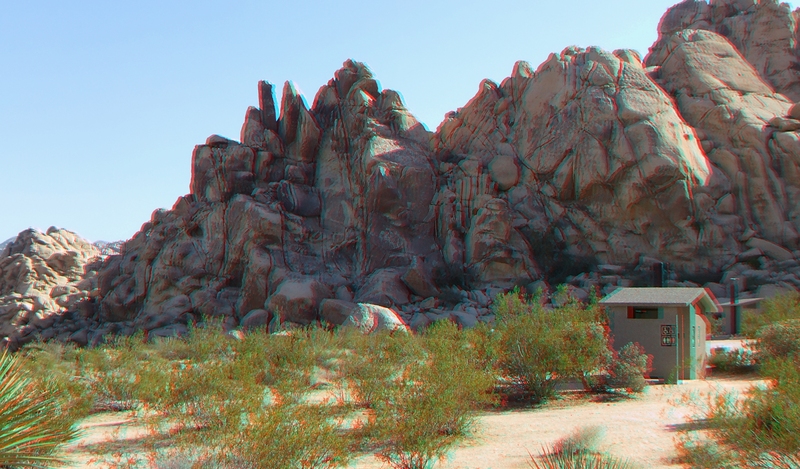 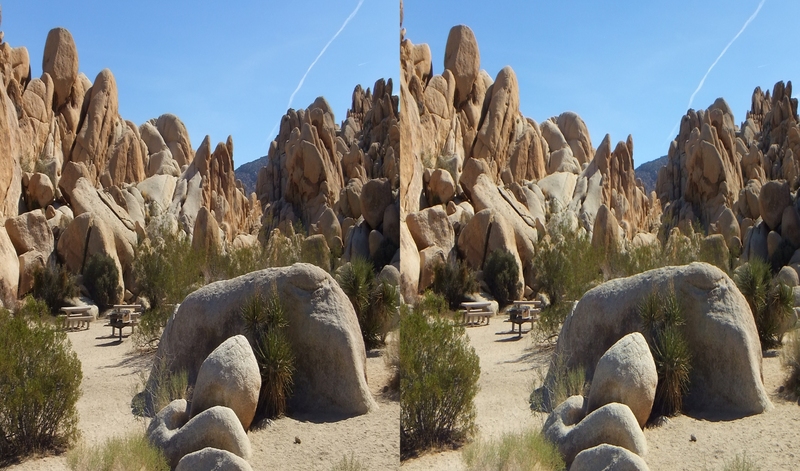 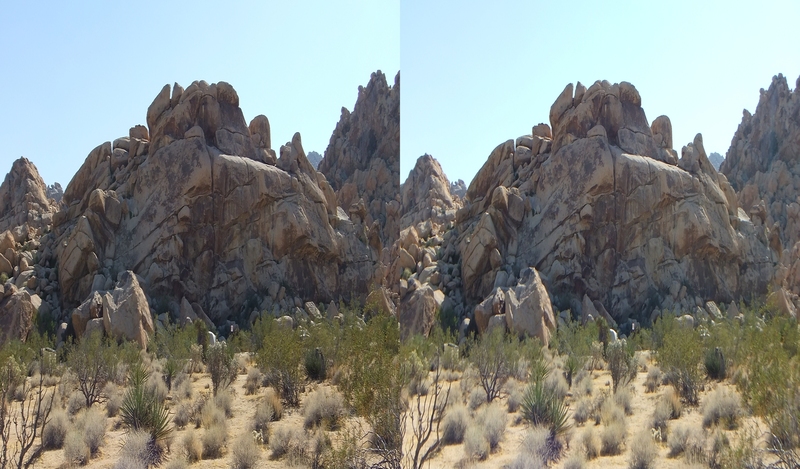 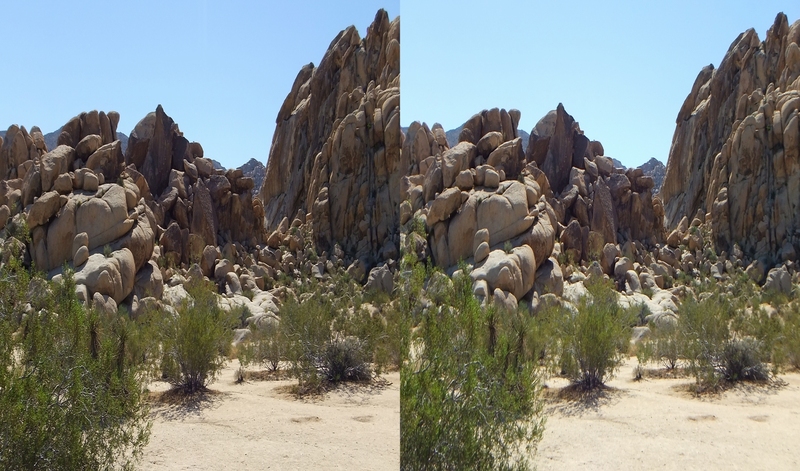 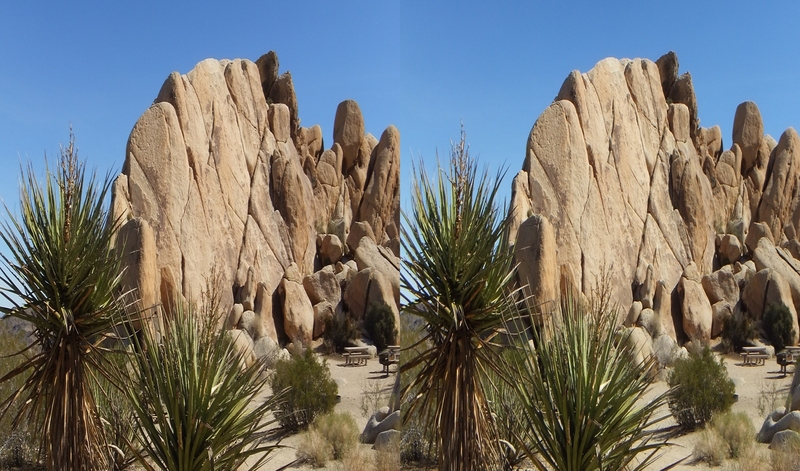 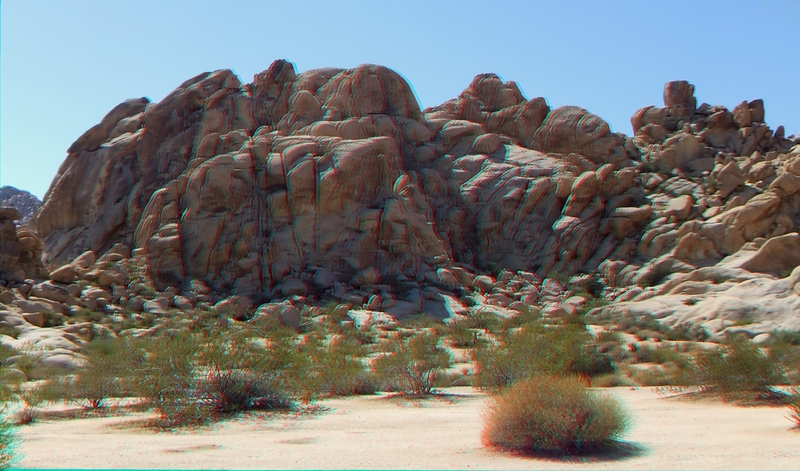 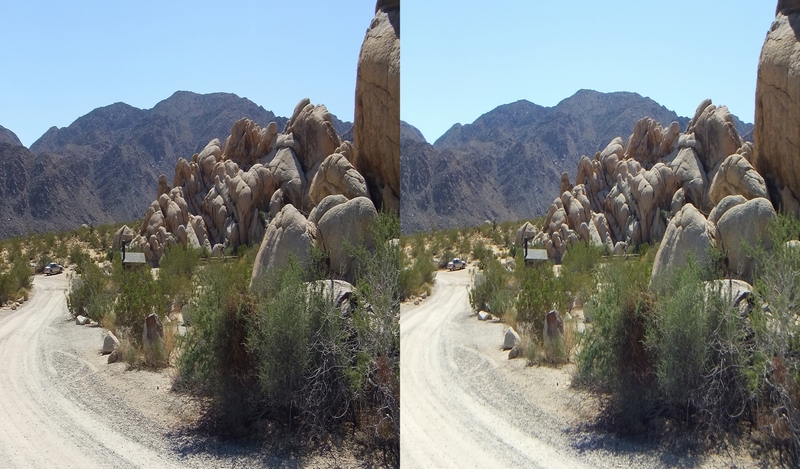 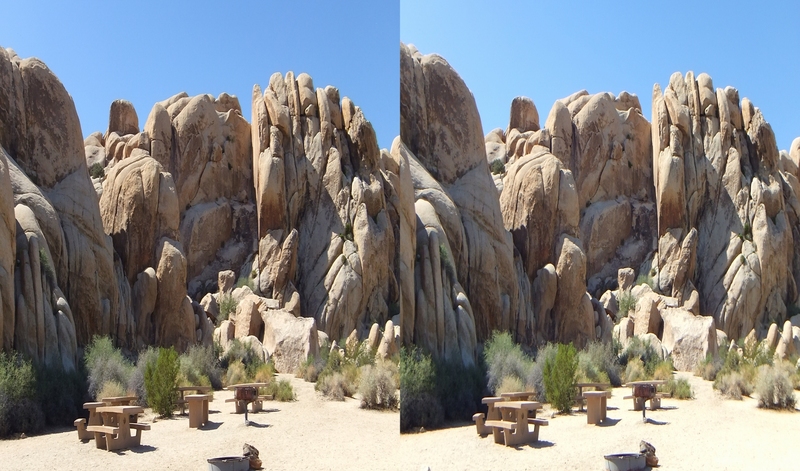 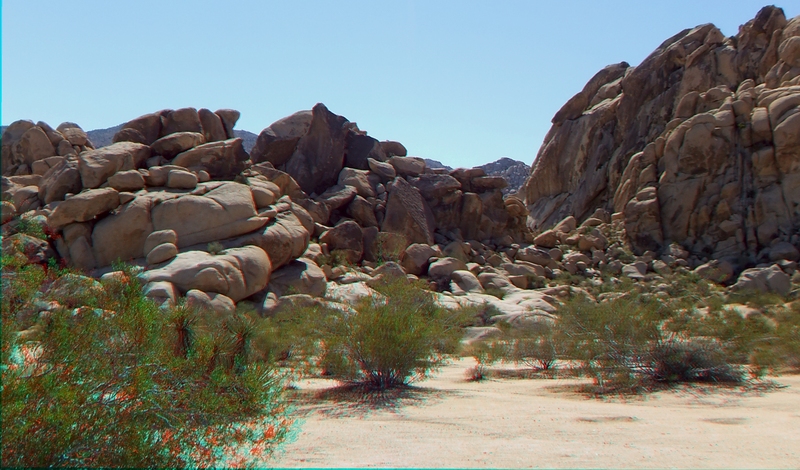 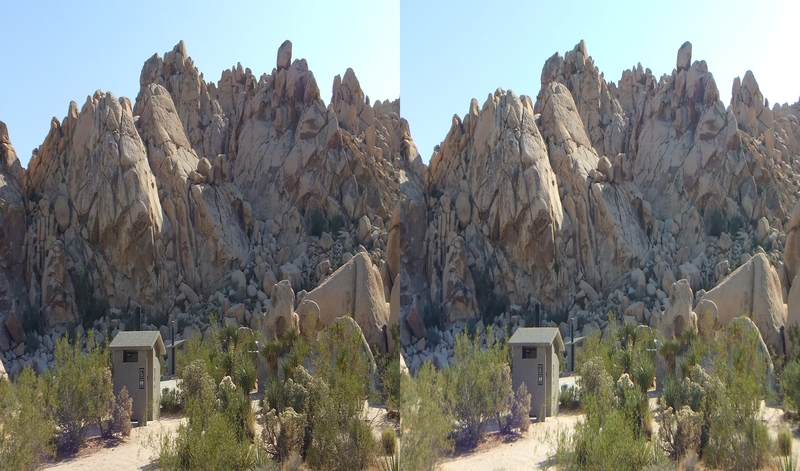 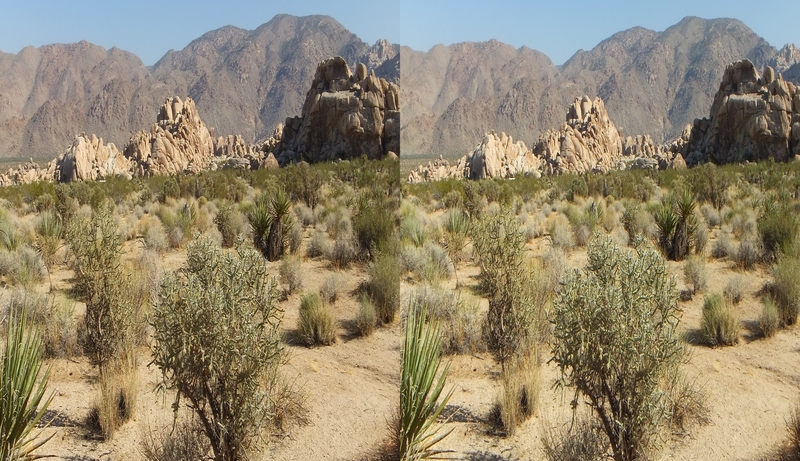 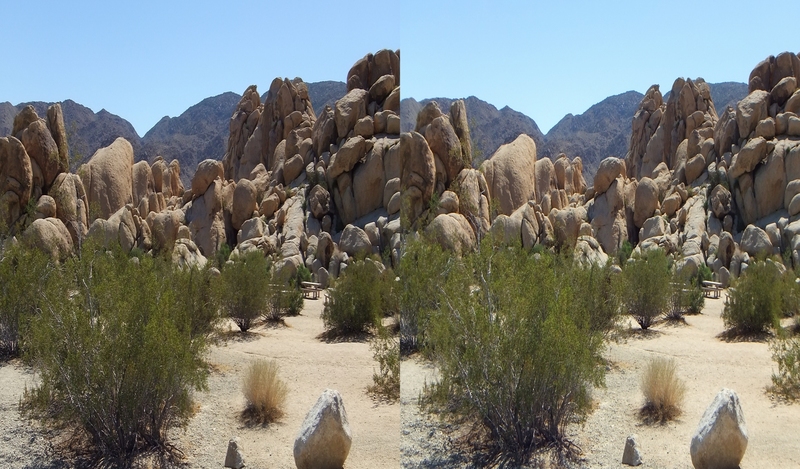 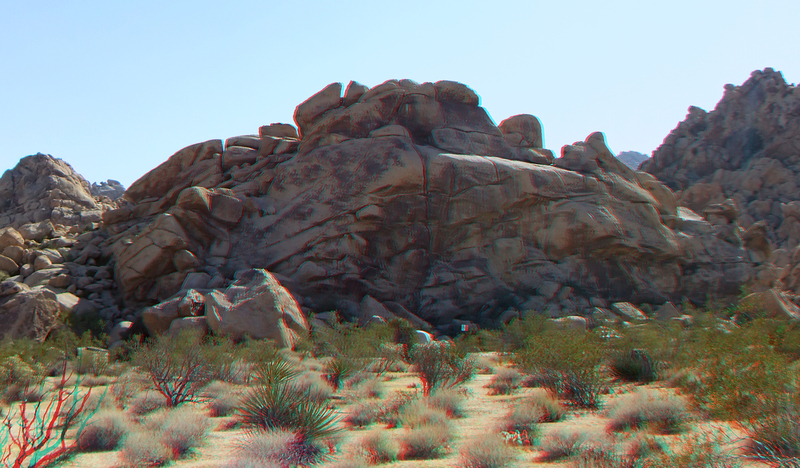 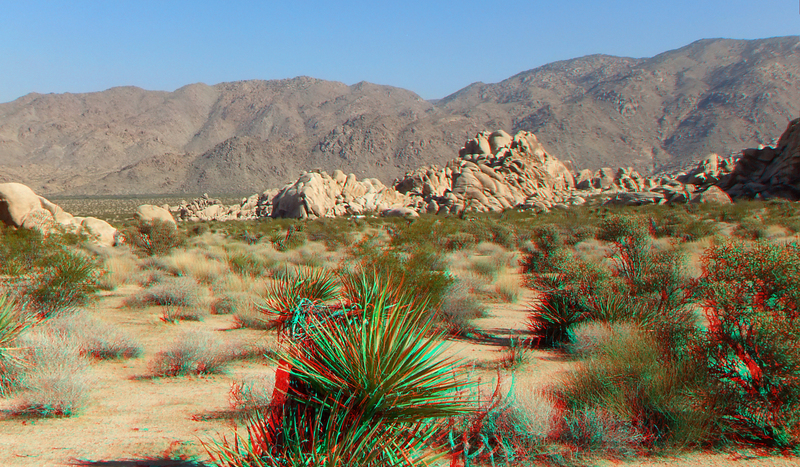 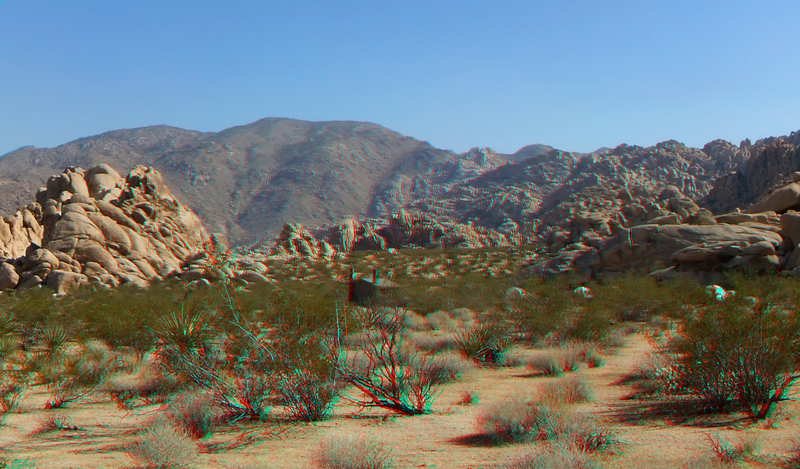 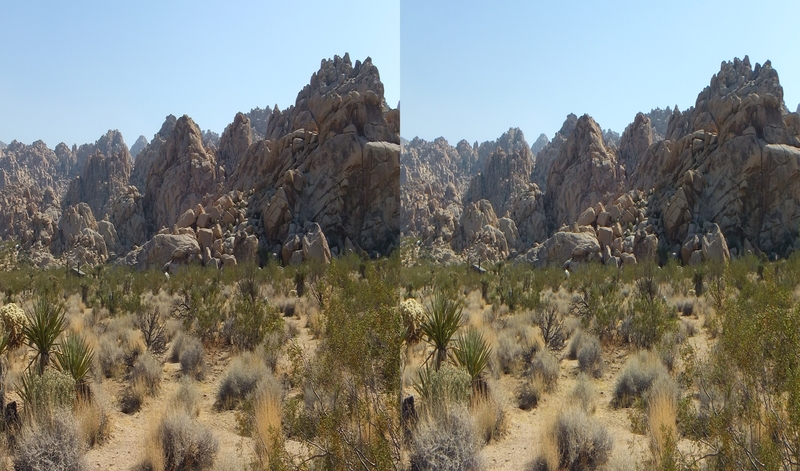 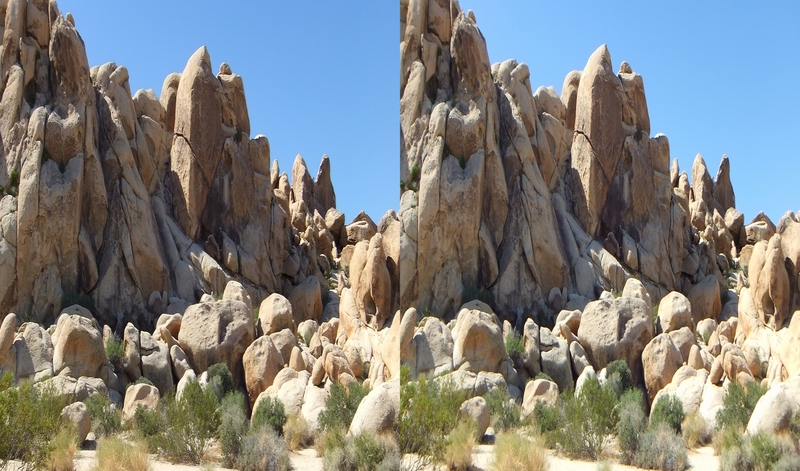 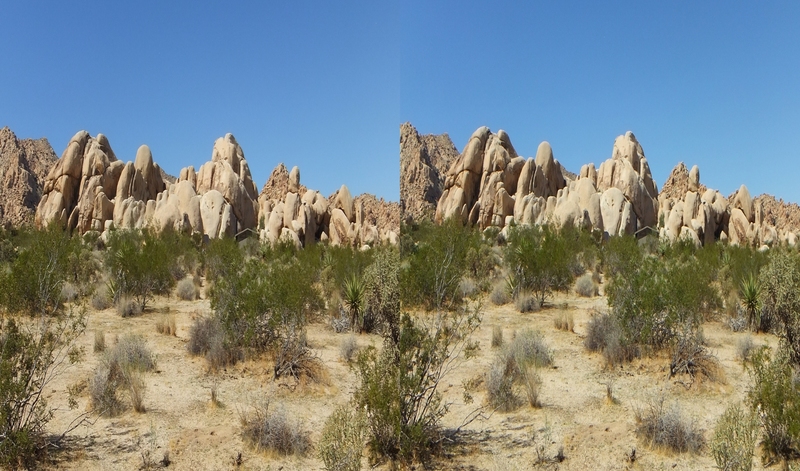 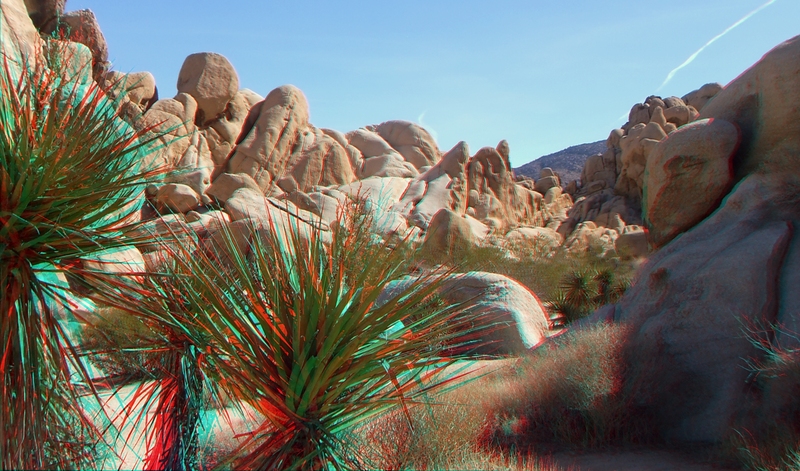 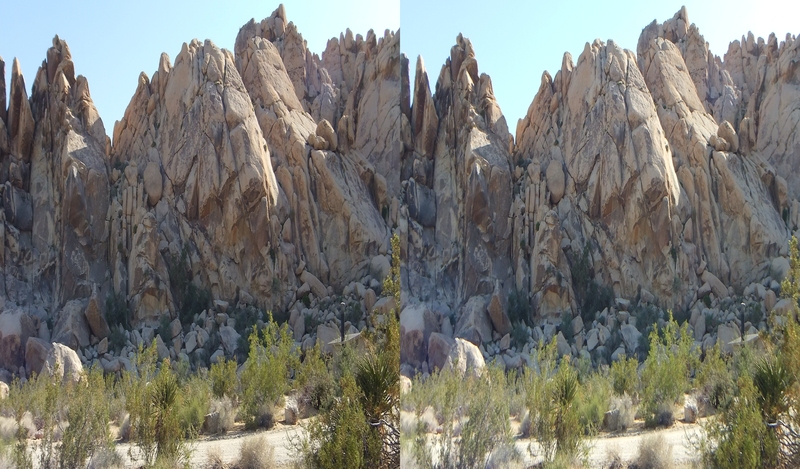 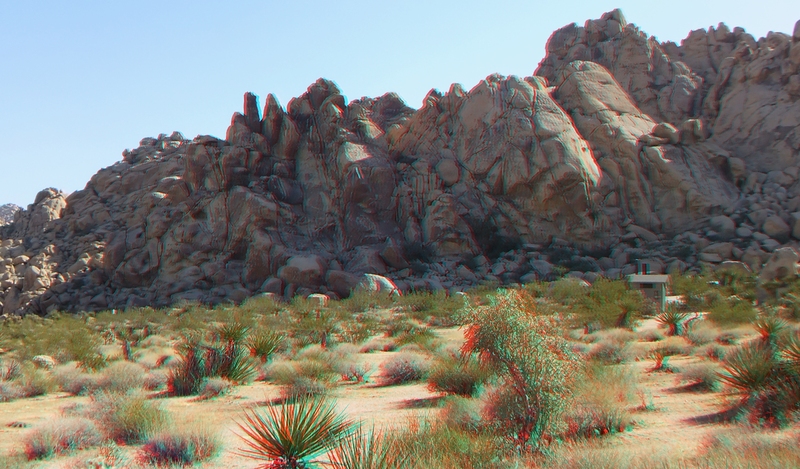 Thank you for visiting the Indian Cove Group Campground Galleries at Joshua Tree 3D, including the rock/climbing formations around the perimeter of the campground.